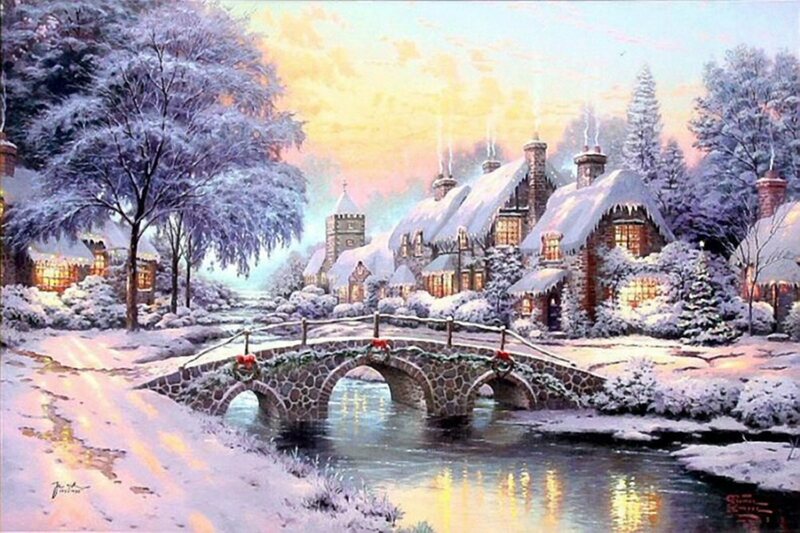 Welcome to my Thomas Kinkade Art Store Hub. 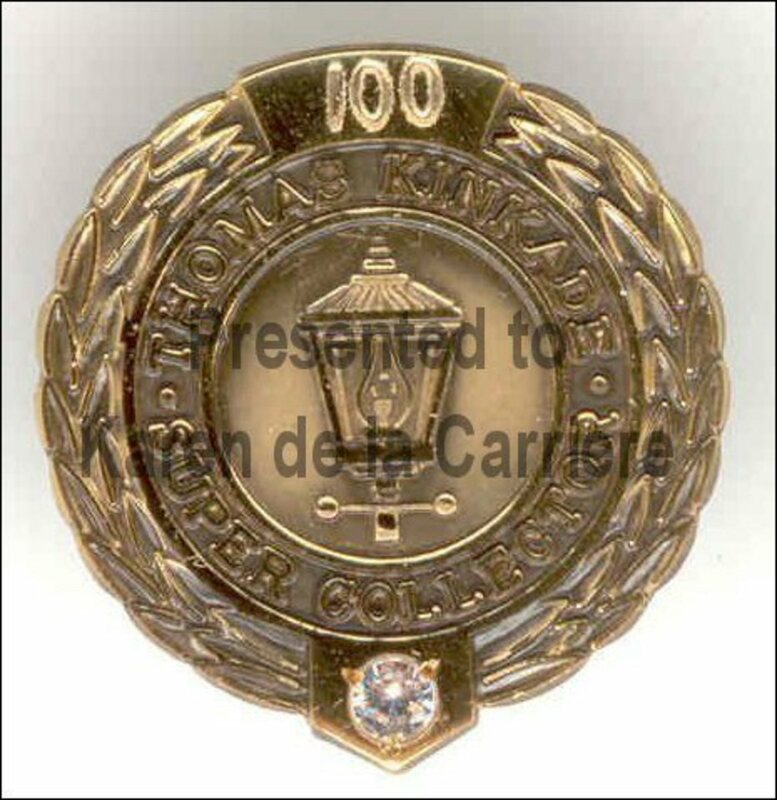 I am Karen de la Carriere, the #1 Thomas Kinkade Artwork Collector in the World with 192 Thomas Kinkade paintings. 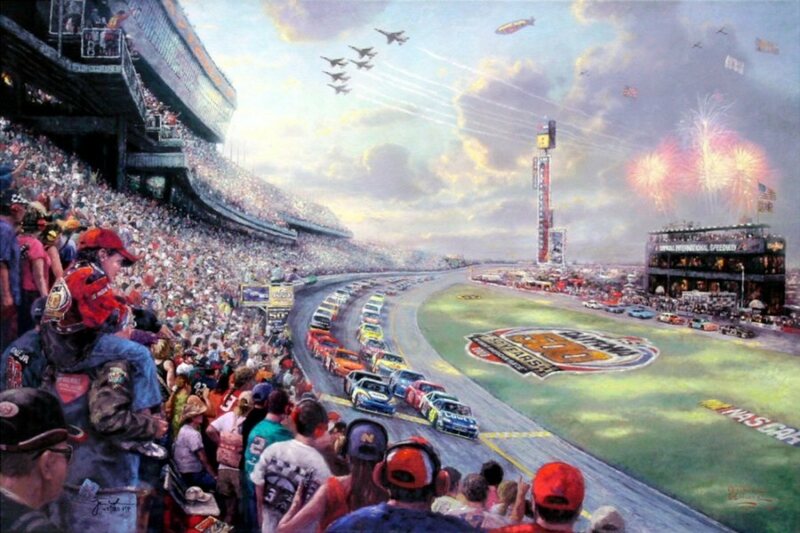 I am the proud owner of several Kinkade originals in my private collection and can advise you from a Collector's viewpoint and hat ~~(An Original is defined as a painting created and painted from beginning to end by Thomas Kinkade brushstroke by brushstroke). 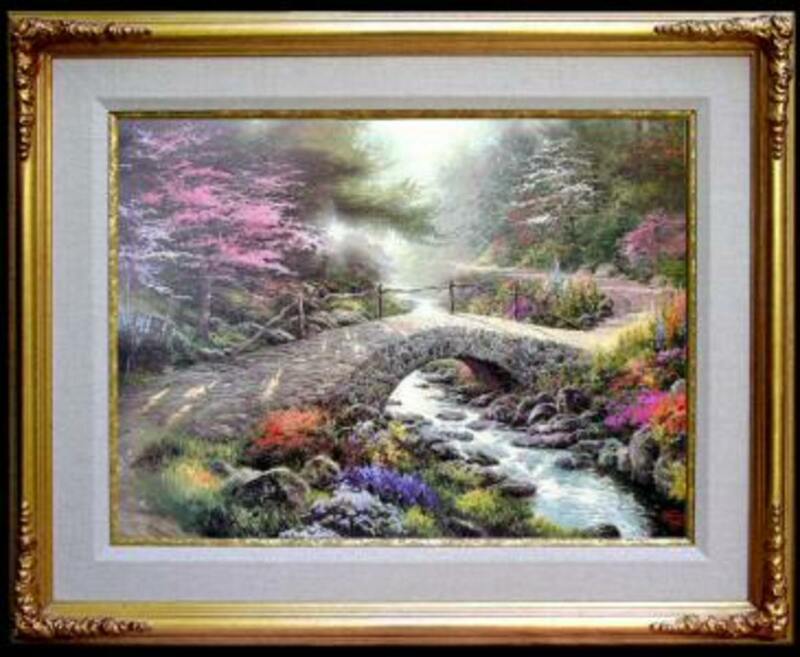 Don't see or cannot find that special Kinkade painting you are looking for? Fly high with the Angels Tom. You are one of a kind and you left a legacy. 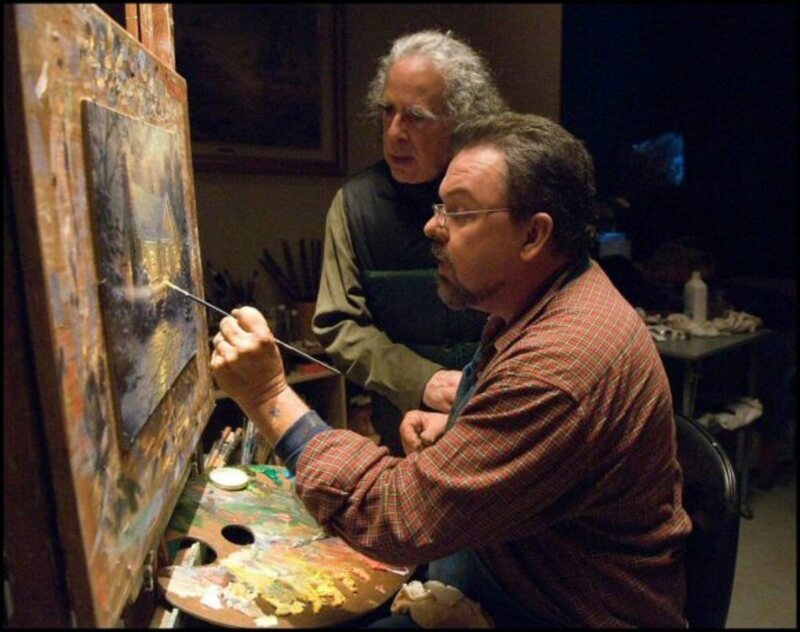 Movie Director Michael Campus watches Thomas Kinkade working on his painting "The Christmas Cottage"
Thomas Kinkade has sold more canvases than any other painter in history--more than Picasso, Rembrandt, Gaughin, Monet, Manet, Renoir and Van Gogh combined. He is to Art what Henry Ford was to automobiles. He is the most collected living artist in the U.S. and worldwide (60 minutes CBS). 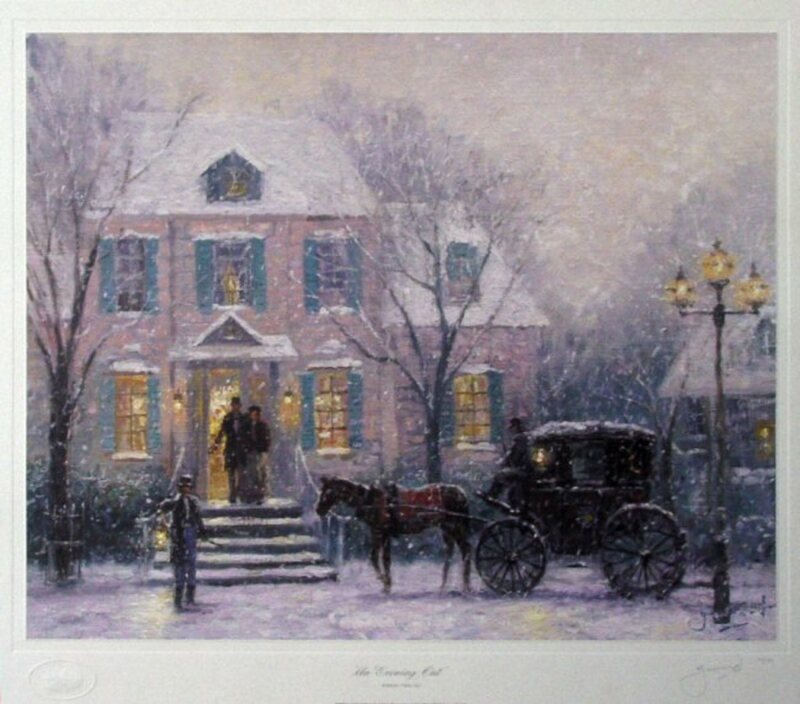 One in Every 30 Americans own a Thomas Kinkade image whether in stationary, greetings cards, jig saw puzzles, afghans, night lights, Lazy Boy chairs, clocks, watches, train sets, lighthouses, plates, or high end canvsses which is what I sell. 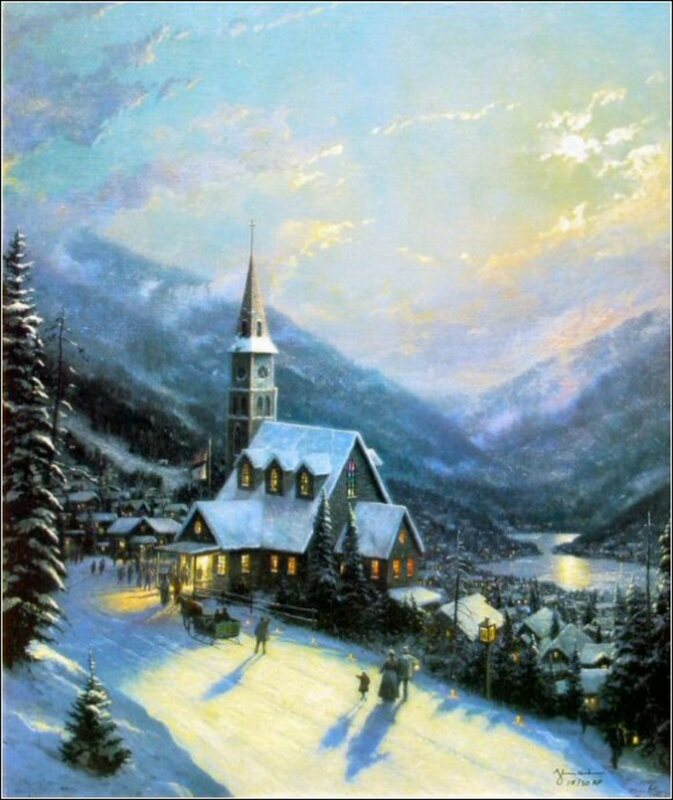 Thomas Kinkade paintings radiate light and by using lighting with a dimmer switch you can literally change the painting from dawn to mid-day sun to sunset, which Thom attributes to soft edges, a warm palette and an overall sense of light. You are invited to visit with me and Share the Light! I'm available TOLL free (1-800-213-6415) late evenings to consult with even weekend evenings up to 10pm Los Angeles time. 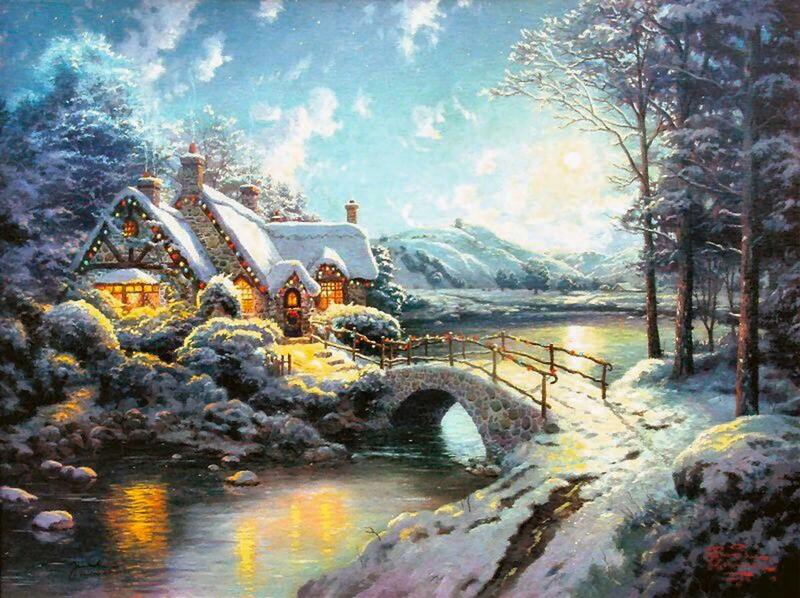 Thomas Kinkade was born 19th January 1958 of German/Irish heritage. Born the second child of Bill and Mary Anne, William Thomas Kinkade III arrived in Sacramento, California, on Jan.19,1958. 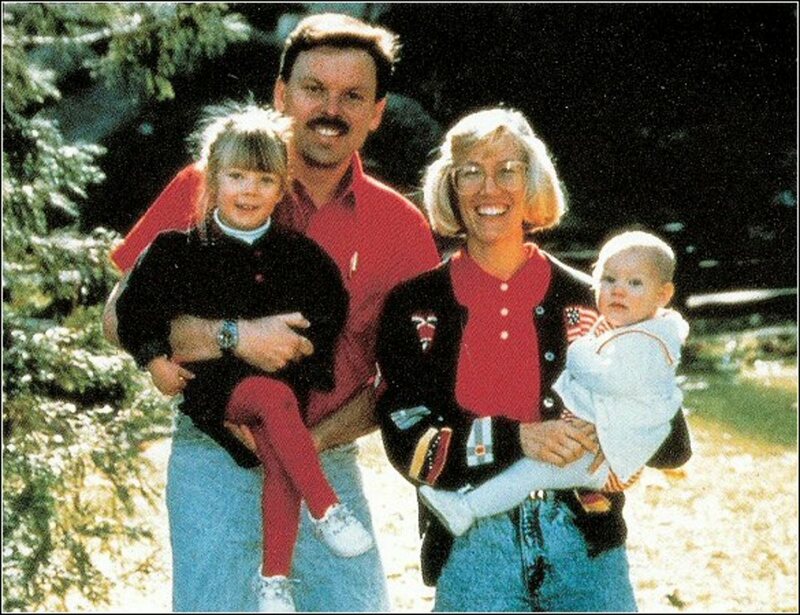 and grew up in Placerville, California, (near Sacramento) with his mother, older sister and younger brother. His father left the family and he was raised primarily in a single family household. 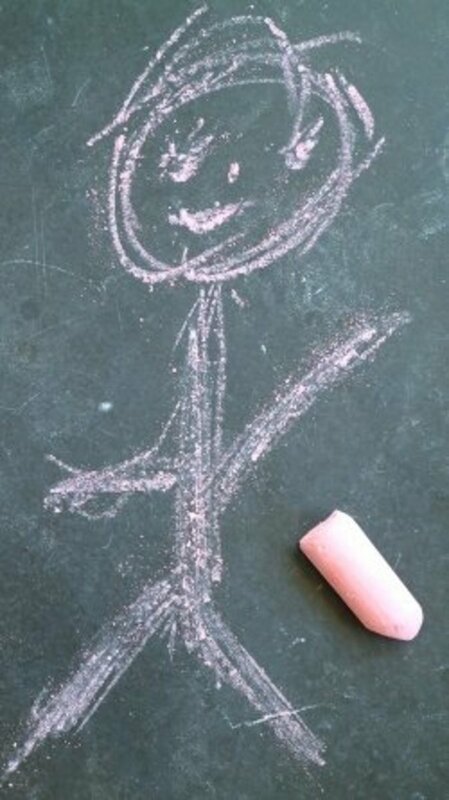 Soon his family knew at a very young age that Thom was a gifted artist. At age 4, he was correcting the perspective of a roadway that his sister had drawn beside a house in a picture! From that age on, his direction was set. By age 13, he was painting at a professional level in oil, much to the amazement of his fine art teachers at the local high school. He sold his first painting at age 11 for $7.50. The woman who bought it remembered thinking at the time, "I'd better hold onto this picture. It will probably be worth something someday." Thom chose Berkeley for his first two years of college. During his years at Berkeley, but at Berkeley, the philosophy seemed to be, "Express yourself, FOR yourself" in a very self-absorbing , self-focused way. The Berkley ethics and mores were not something Thom could agree with and so left and he enrolled at the Art Center College of Design located in Pasadena, California. In Berkeley, he met and became fast friends with a fellow artist by the name of James Gurney, who later became the author of the best selling book "Dinotopia". When Gurney joined Thom at the Art Center, the two decided to take an adventure over the summer aboard boxcars. They would stop by pubs and start out by sketching the bartender. Thom would give the sketch to the barkeep and ask if he could paint the patrons that came in. The bartenders usually said yes and Thom would set-up at the end of the bar with a jar and a sign that read, "ketches - $2.00". 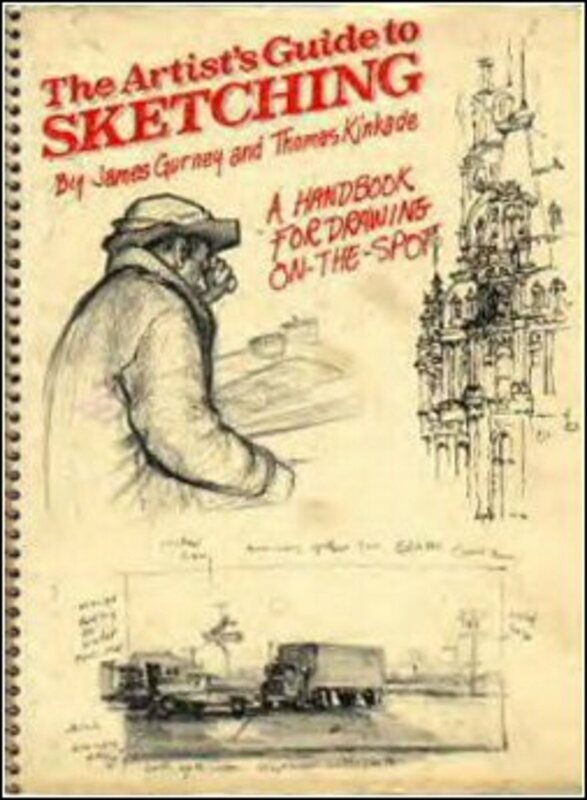 People enjoyed the sketches so much that Thom and Jim thought it would be a great idea to teach people how to sketch. So they said, "Let's write a book". One night they spent hours on the pier above the Hudson River and banged out what became "The Artist's Guide to Sketching". The book is now worth about $500.00, if you can find one. In 1983, Placerville Library commissioned Thom to do a painting of the town to hang in a new library facility. He researched the history of Placerville through oral histories, archival photographs and old fire-insurance maps. He chose a rainy afternoon to give it a nostalgic feeling, and he recruited friends and family to pose for the central figures. He even painted a miniature self-portrait on a poster hanging on the wall below the post office sign. Prints were made and sold from a card table outside the local grocery store for $35.00 apiece as a fundraiser for the Friends of the Library. Five years later they were reselling in local galleries for prices as high as $2,000.00. In 1984, Thom traveled to Alaska where he met a bush pilot, Hoppy Harrower. Thom decided that he wanted to paint a suite in the Yukon, so he told the pilot he would give him the original of the first work he painted, worth $4,000.00, if he would fly him around the area for 3 weeks. The painting became known as "Dawson". It was Thom''s first published painting in 1984. Signed and Numbered 12x16 Limited Edition only 980 in the world! "Beauty and the Beast Falling in Love"
Thomas Kinkade's Beauty and the Beast will be the sixth release in the Disney Dreams Collection and is expected to be the most popular and demanded Thomas Kinkade Disney release ever! Thomas Kinkade has spent over 700 studio hours on this painting which is the most he has ever spent on any painting. Beauty and the Beast Falling in Love features the 4th of 6 Princess to be painted by Thom. Beauty joins the other current Princesses: Snow White, Cinderella, and Tiana (From Princess & The Frog). Now available in all editions and sizes! The Wizard of Oz Collection (see below) initiated the introduction of the new collections featuring iconic films. Warner Brothers and Thomas Kinkade announced the coming artwork featuring the classic Movie Gone with the Wind to be the next film to be featured. The Wizard of Oz Collection initiated the introduction of the new collections featuring iconic films. Warner Brothers and Thomas Kinkade announced the coming artwork featuring the classic Movie Gone with the Wind to be the next film to be featured. IIn June of 2008 The Wizard of Oz was ranked #1 on the American Film Institute's list of the 10 greatest films in the Fantasy genre. A recent study claimed that this is the most watched movie in film history, largely due to the number of television screenings each year as well as video which has enabled children of every generation to see it. 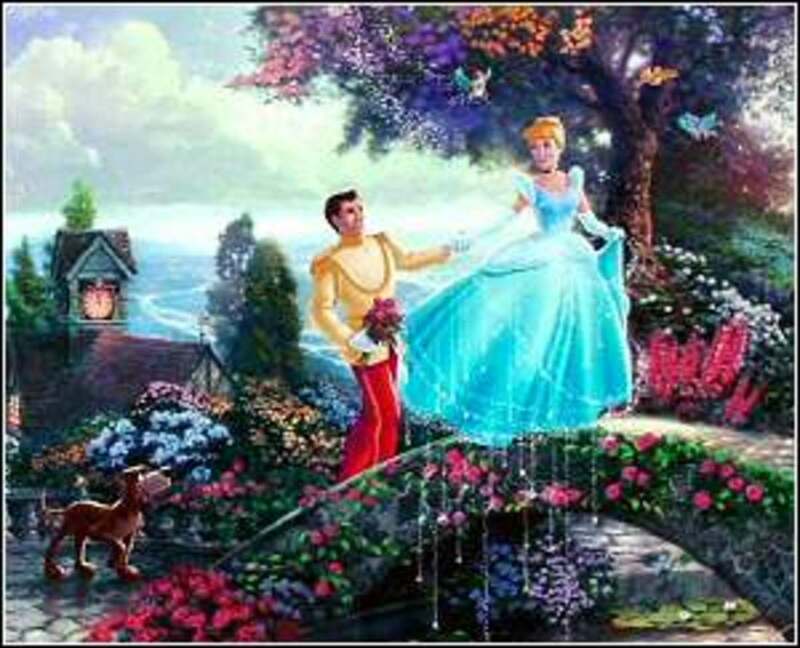 Warner Brothers Studios recruited Thomas Kinkade to be the official artist of the 1939 release of America's greatest and best loved home grown fairy tales. 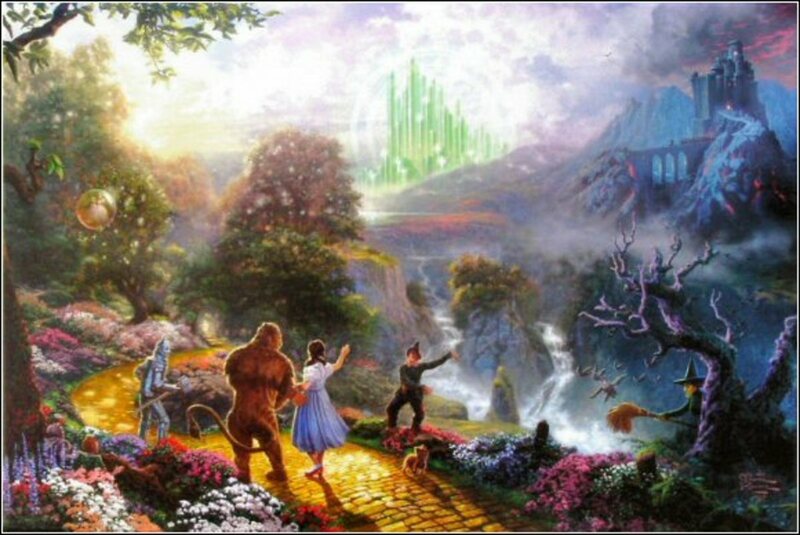 This painting is the first of eight Wizard of Oz paintings by Thomas Kinkade. Thom refers to this as his Oz Octet. These eight paintings play off one another and will depict the story of the Wizard of Oz since each one will build upon the next. "Dorothy Discovers the Emerald City" is the first work of what will become Thom's "Oz Octet". In the painting you'll notice that Toto is the only character that reacts to the Wicked Witch, as the Wizard of OZ - Dorothy Discovers the Emerald City others are distracted by the awing influence of the Emerald City as they view it for the first time. 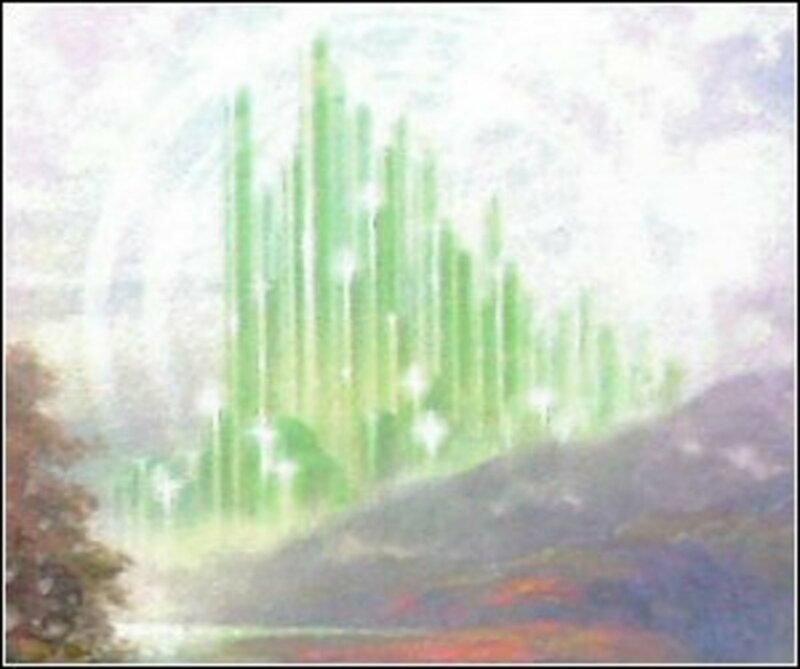 "Dorothy Discovers the Emerald City", as with Thom's Disney collection, attempts to capture the quintessence of the complete film in one panoramic Wizard of OZ - Dorothy Discovers the Emerald City. Look closely along the Yellow Brick Road, to find the Apple Tree that said "Ouch", when Dorothy tried to pick an apple off of it. Thom has hidden 88 dedication hearts to embrace the love of his mother Mary Anne- who celebrated her 88th birthday this year. 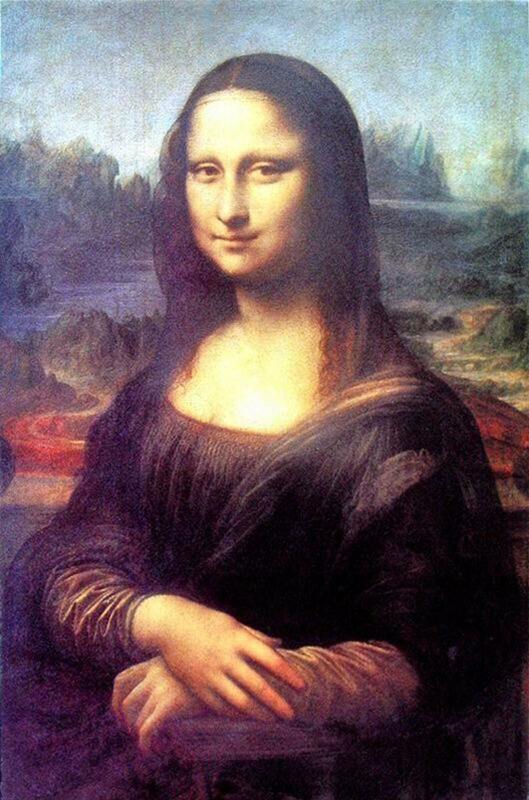 Popular artist has sold $4 billion in paintings. 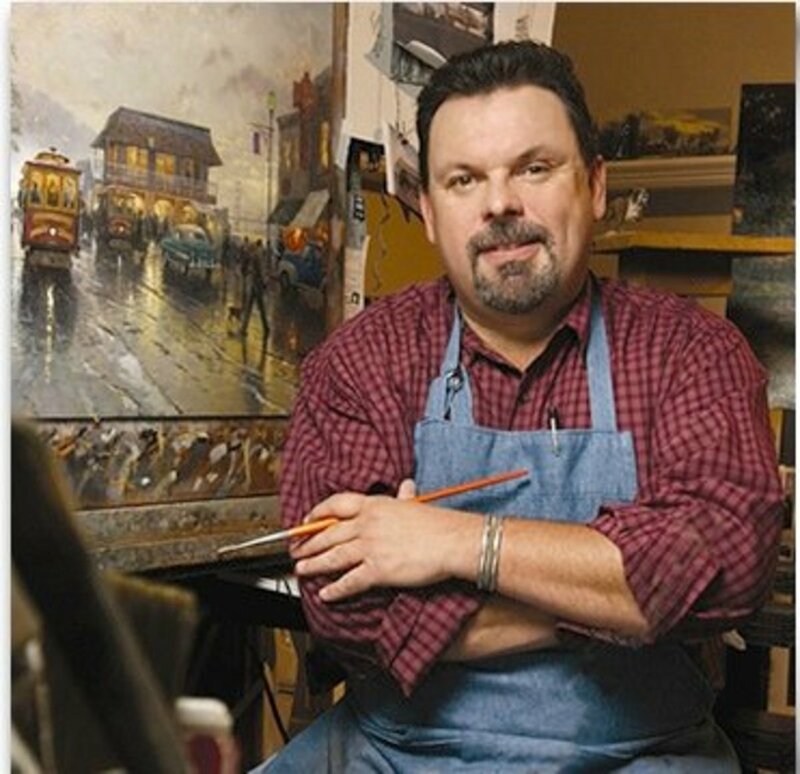 Thomas Kinkade has inked with Creative Artists Agency. Artist has signed with the tenpercentery in an effort to seek out TV, film and Internet projects. CAA will rep both the artist and his company, which has earned more than $4 billion over the past 15 years from selling paintings and licensed merchandise. 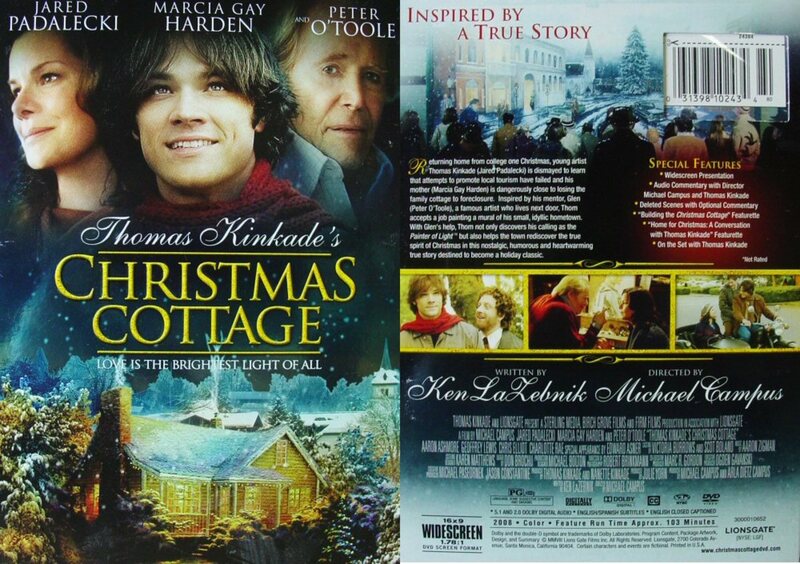 Move comes after his painting "The Christmas Cottage" was adapted as a direct-to-homevid pic that was released by Lionsgate in November. It's the first of a series of planned homevids based on Kinkade's early years as an artist. Kinkade continues to be managed by Dan Spilo of Crosby/Spilo Management. 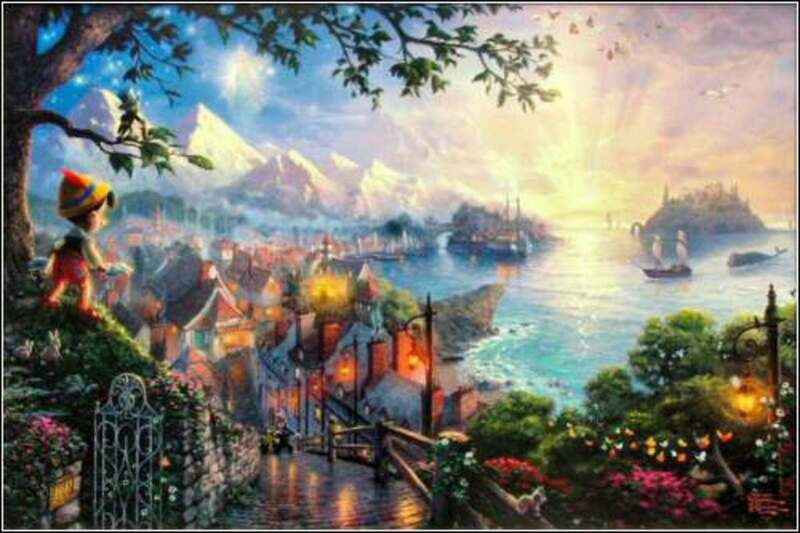 Thomas Kinkade is a modern day Leonardo da Vinci. (I was actually quoted in the Los Angeles Times) with this exact sentence. Once in a while in our generation, someone with great talent comes along. Thomas Kinkade is one of them. A recent professor at UCLA asked students to name a famous living artist. 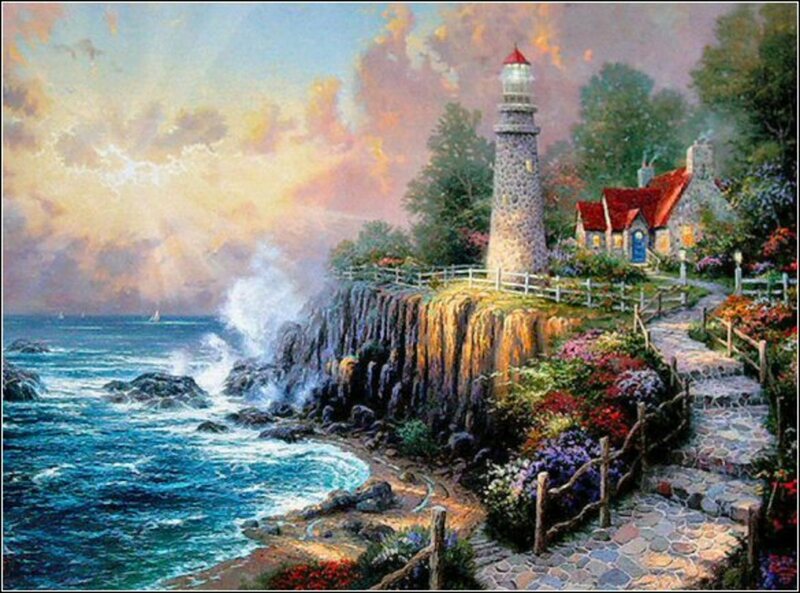 The whole room could only name one ~~ Thomas Kinkade. No artist has been able to play with light and shadow and have the painting "glow" and change from dawn to mid day sun back down to sunset. 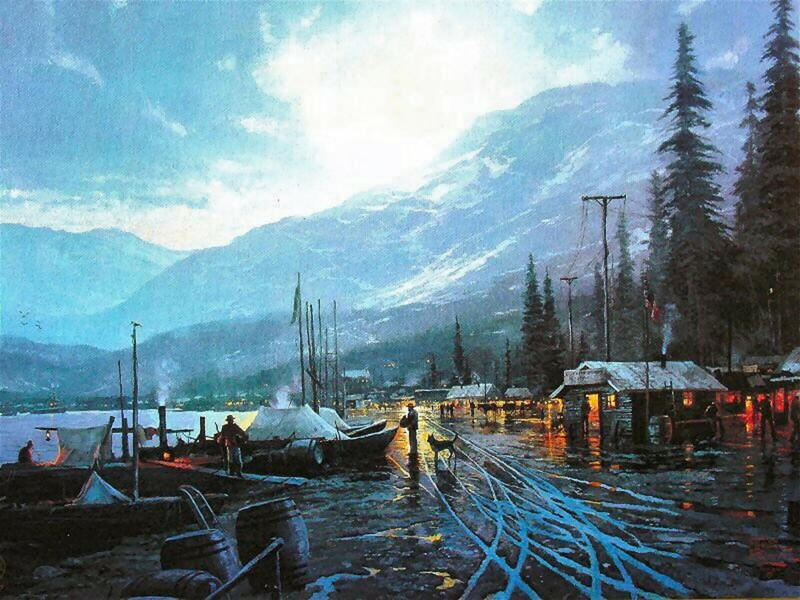 Look at this and observe Tom's study of Light and Shadow I have more clients that purchase a Kinkade as a family heirloom than for any other reason other than Birthdays, Anniversaries and Christmas. Think about it. There isn't much one can comfortably leave in a will that guarantees a place in a home. Jewellery gets lost/stolen/pawned. Cars take up lots of space and deteriorate over time. Furniture is not appreciated by more modern generations whose taste in furniture changes with time. 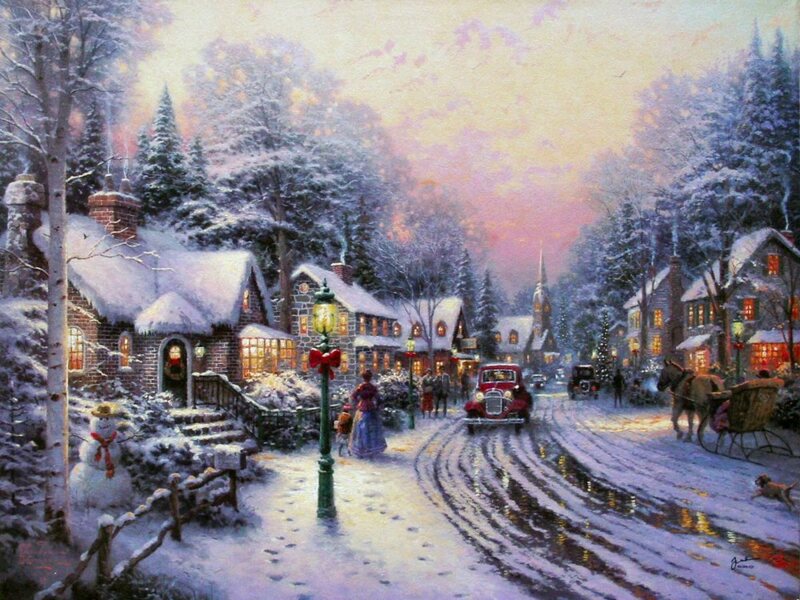 But a beautiful work of Art, a best seller Thomas Kinkade that actually goes up by 15% to 10% annually brings you beauty and pleasure and enjoyment all year round and goes up annually to boot. 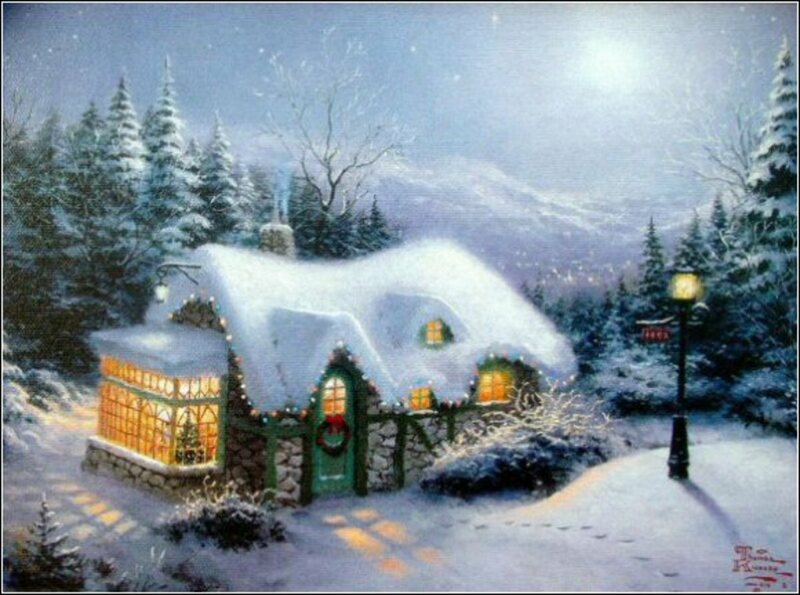 Thomas Kinkade has a particular affection for Christmas and the Holiday Season and hisrelated artwork are among the favorites of many collectors. 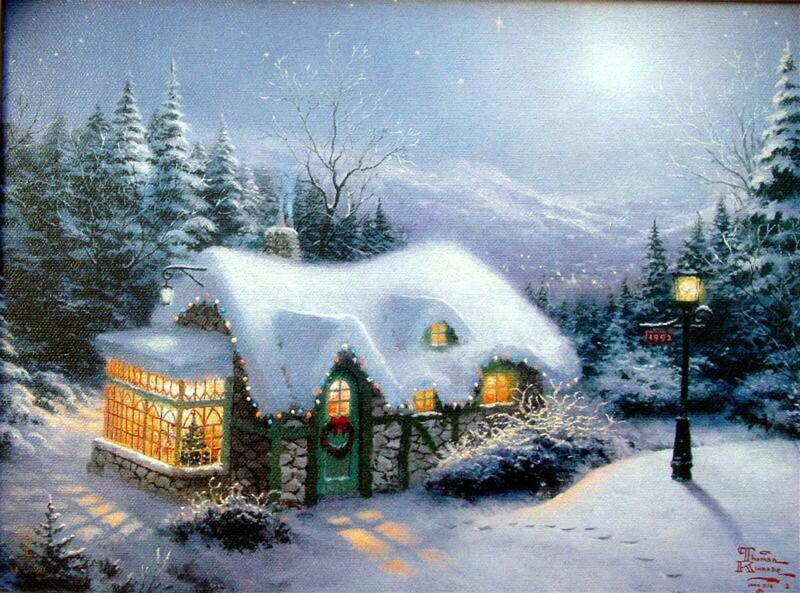 "The holidays are a buffet for the senses, and Thomas Kinkade's holiday themes capture these spectacular images". According to Thomas Kinkade's biography, America's most collected artist had a Tom Sawyer-like childhood in the Norman Rockwellesque hometown of Placerville, California. 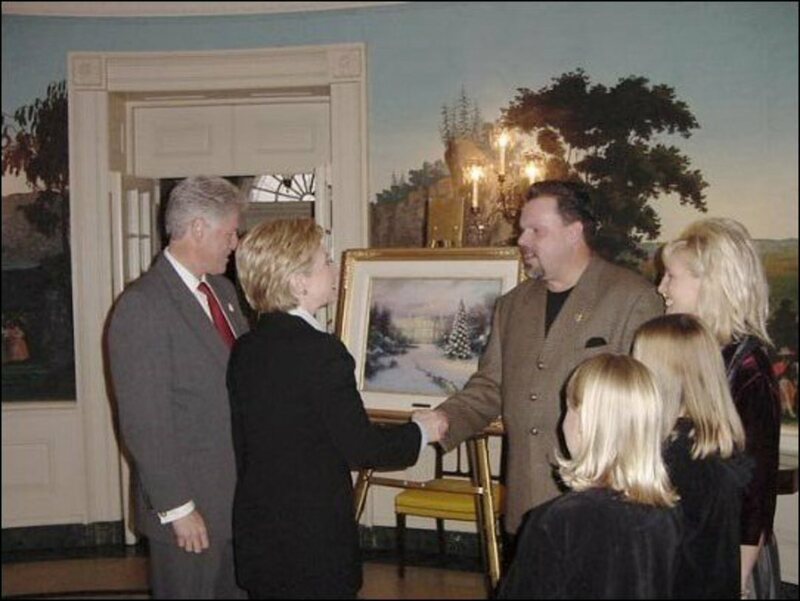 These days you can have a "Thomas Kinkade tour" in Placerville visiting his school, the original gallery, and the Christmas Victorian Homes he has painted which are actual houses in Placerville. 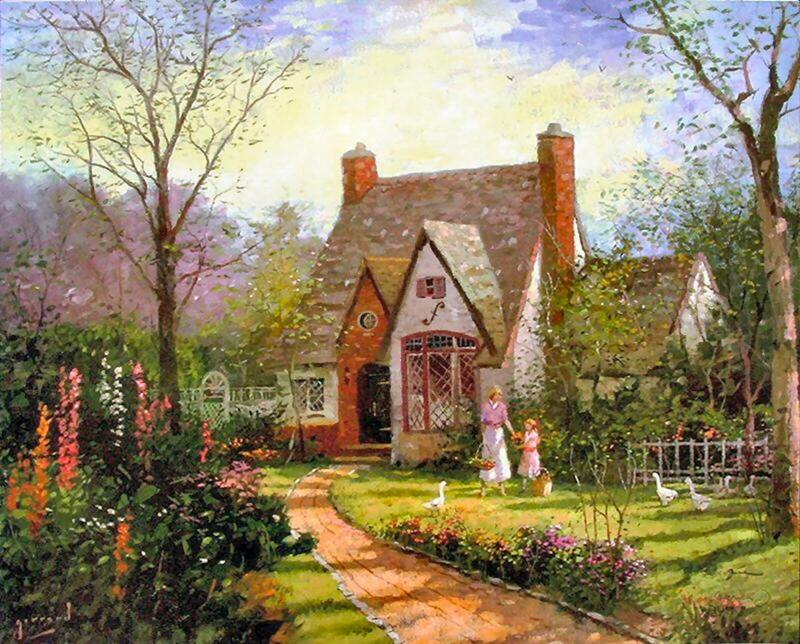 Many of Thomas Kinkade's cottages are based on actual homes in the English countryside or in the San Francisco bay area, or Placerville near Sacramento. His cottages glow with a warm and fuzzy light, recalling a nostalgic, idyllic past--that never existed for him. Thomas was raised by a single parent and was always told to switch lights off to save on utility bill. He walked home to a dark and cold home in Winter (all lights off). For Thomas, the light in his paintings "represents God's presence and influence." The Painter of Light warns us of the pitfalls of light deprivation. "For three long years I lived in arctic Lapland, where winters are inconceivably cold and interminably dark. Like many people lacking sunlight, I became affected with S.A.D. (seasonal affective disorder), and daily I battled with feelings of desolation and melancholia." I think it is a triumph of the soul that he has mastered the effects of light and shade and sold more canvases than any other painter in history~~ More than Picasso, Rembrandt, Gaughin, Monet, Manet, Renoir and Van Gogh combined. Thomas Kinkade was born in 1958 and grew up in Placerville, California, (near Sacramento) with his mother, older sister and younger brother. His family knew very early on that Thomas was a gifted artist. At age 4, he was correcting the perspective of a roadway that his sister had drawn beside a house in a picture. From that age on, his direction was set. By age 13, he was painting at a professional level in oil, much to the amazement of his fine art teachers at the local high school. He sold his first painting at age 11 for $7.50. The woman who bought it remembered thinking at the time, "I'd better hold onto this picture. It will probably be worth something someday." 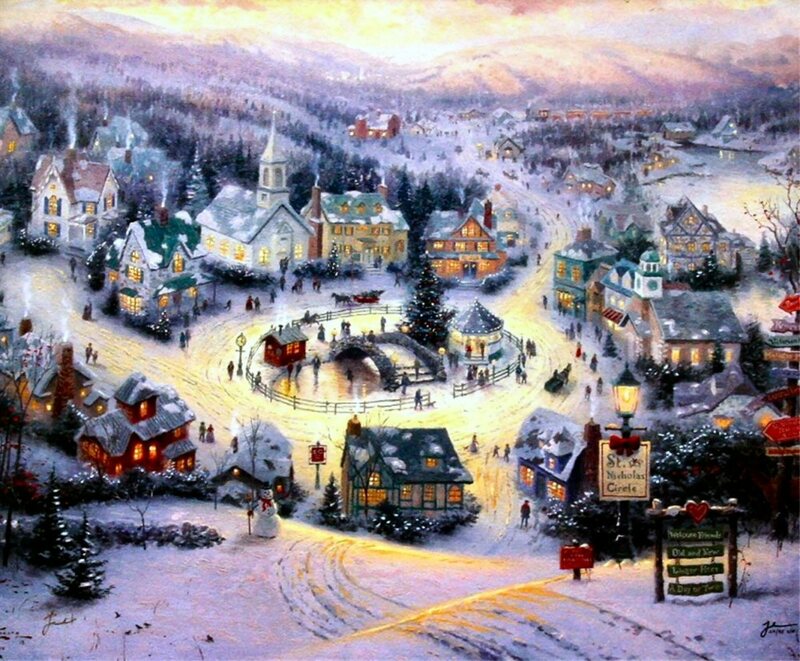 Nearly all Christmas, Winter, and Snow scenes Thomas Kinkade painted has become a best seller escalating in value annually. St. Nicholas Circle (shown here to the right) was painted in Norman Rockwell Studio in Arlington Virginia. Norman Rockwell was a big hero of Thomas' (he owns several original Normal Rockwells') St. Nicholas Circle looks like a Norman Rockwell painting -pure Americana. This painting now hangs in the White House Foyer. 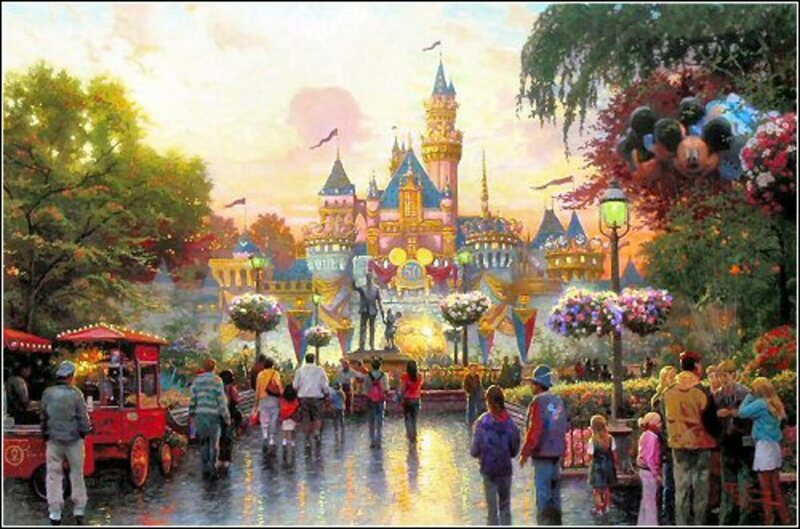 Thomas Kinkade created a new painting to Celebrate Disneyland's 50th Anniversary. "Festooned with decorations, flags, and banners celebrating Disneyland's 50th. I couldn't resist painting my own family among the crowd. The drama of sunset suggests the end of an era at Disneyland, while the glowing lights at the base of the castle remind us that a new age of imagination and celebration awaits." I used a whimsical brush: Is Bambi on the lawn? Tinkerbell above the castle spires? The Ugly Duckling in the pond? You decide." . 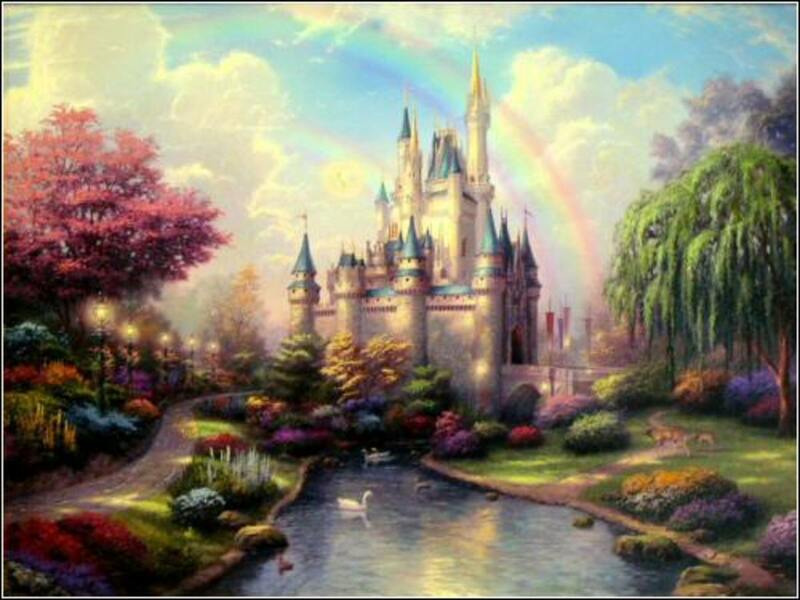 The first painting in Thomas Kinkade's new Disney Dreams series. 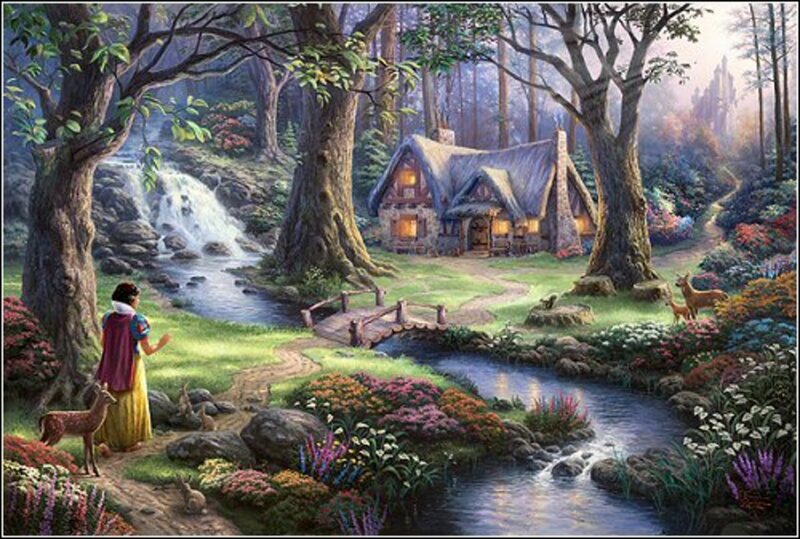 Thomas Kinkade worked on this masterpiece, "Snow White Discovers the Cottage", for two and a half months, spending hundreds of hours to create a timeless fairytale image. This first image in the series honors two of Thom's greatest ideals-home and family-and the spiritual sense of the destiny that we all possess-returning home. 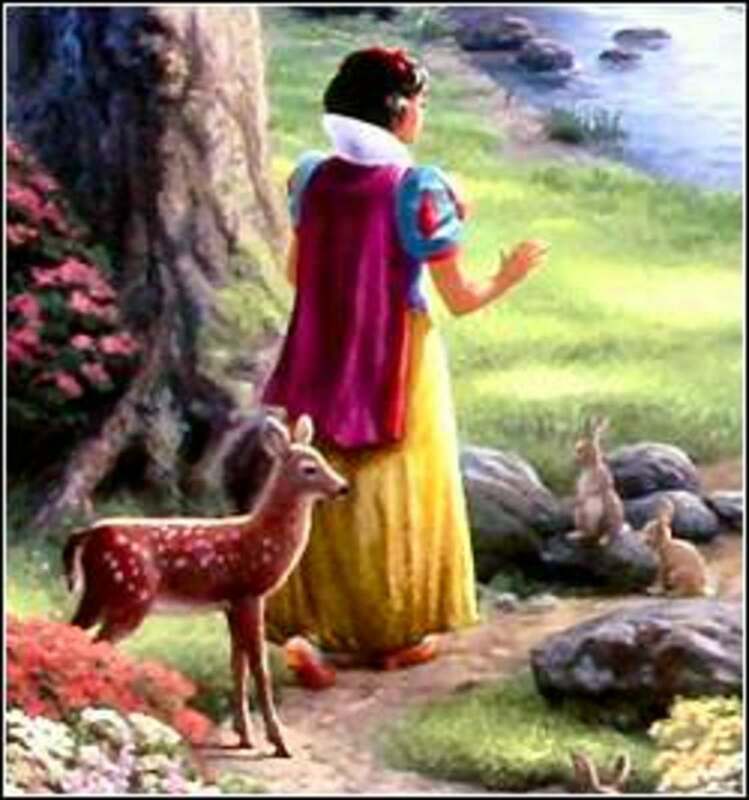 Snow White has just found her true family and safety, and is at peace with nature. Thom has also included in the image as a symbol of wisdom. 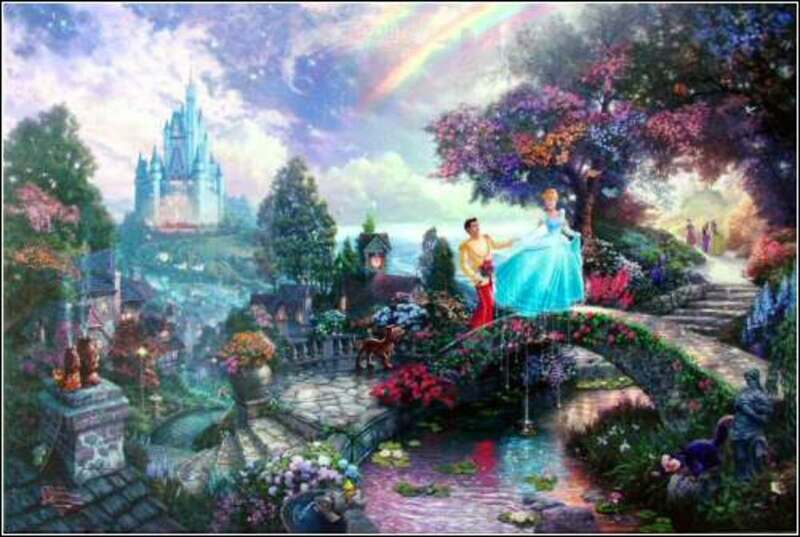 Thomas Kinkade said about this painting "As a child my imagination was stirred by the great animated films of Walt Disney. Imagine my delight when Disney recently opened their archives to me as I prepared for my first-ever series of images inspired by classic Disney moments. 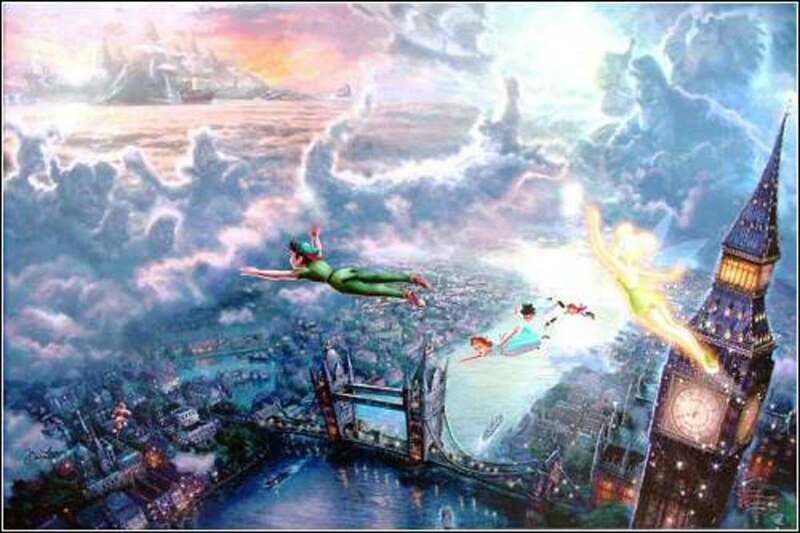 The second painting in the Disney Dreams series. "My 'Disney Dreams Collection' celebrates great moments from Walt Disney Films. I call these paintings 'narrative panoramas' because each painting tells the entire story of the film in one image. For my painting 'Pinocchio Wishes Upon A Star' we see Pinocchio upon a hillside overlooking the setting of his adventures. We see Honest John and Geppetto's workshop where Pinocchio was formed. 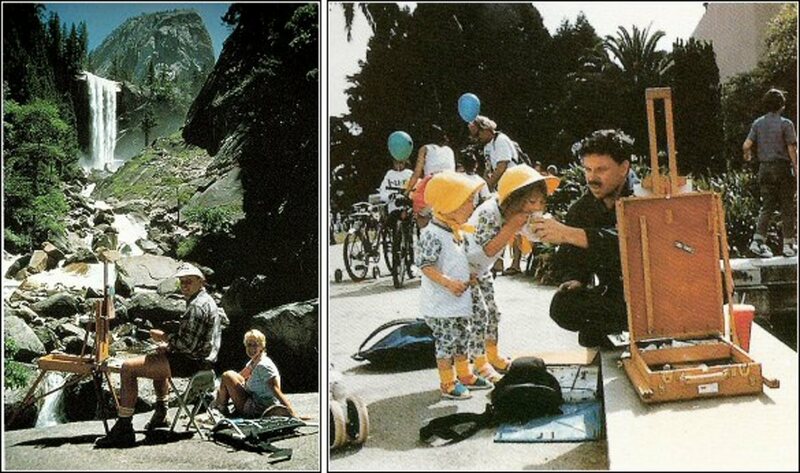 On the right we see Pleasure Island and Monstro the whale preparing to engulf Geppetto's sailing vessel. Butterflies and sparkles lend magical accents as the Blue Fairy and Jiminy Cricket look on. 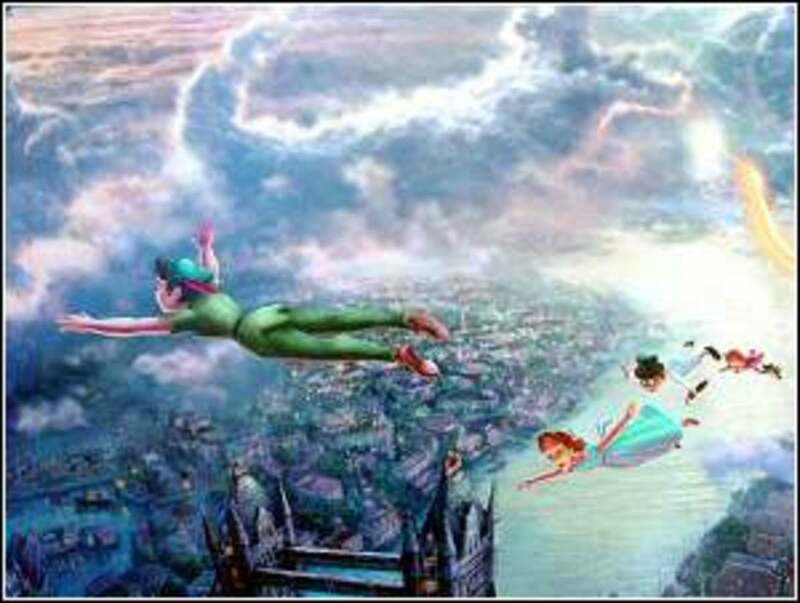 "As the third piece in my Disney Dreams Collection, Tinker Bell and Peter Pan Fly to Neverland promises to be my most exciting work yet! My 'Disney Dreams Collection' celebrates great moments from Walt Disney Films. I call these paintings 'narrative panoramas' because each painting tells the entire story of the film in one image." 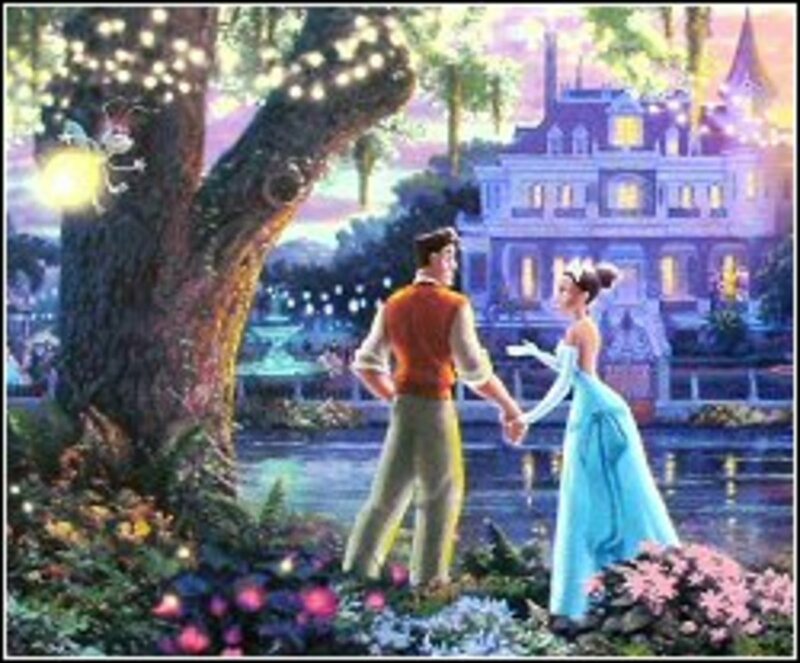 The fourth painting in the Disney Dreams series. Cinderella Wishes Upon A Dream has given me the chance to push the limits of my ability farther than I ever have. On the towering mountain in the distance we see Cinderella's castle, a vision inspired by the movie. Coming down from the castle road we see Cinderella's horseman and coach, galloping towards the sleeping village below. As Cinderella and her prince cross the stone bridge over the lover's reflecting pool, we pause to enjoy the numerous details that make this scene so inviting. 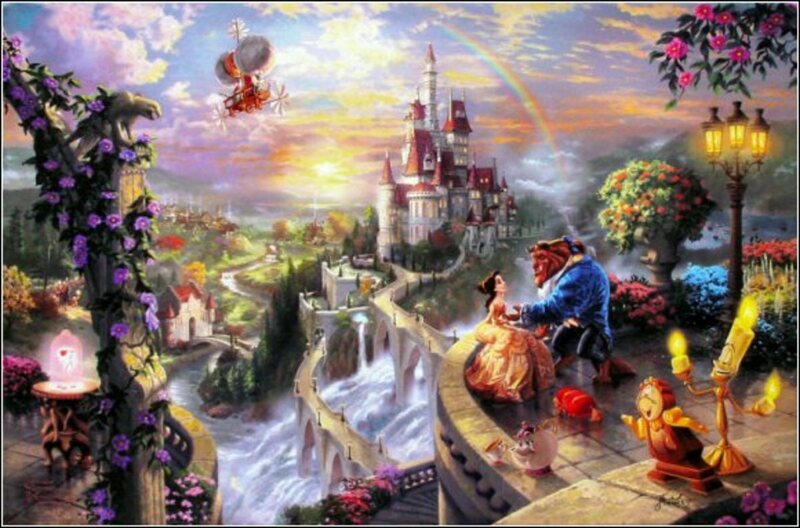 The fifth painting in Thomas Kinkade's Disney Dreams series. "When I set myself the goal of creating the twelve epic paintings for the Disney Dreams Collection, I knew it would be a vast undertaking. After all, each painting in the series presents not just a scene from a classic Disney feature, but a vision of the entire movie in one image - what I like to call a "narrative panorama". In my Bambi painting, I wanted to present a broad look at the events of Bambi's young life, along with the suggestion of his destiny as the newly crowned prince of the forest. I believe Bambi's First Year is the most breathtaking subject in my Disney Dreams Collection to date. I attempted to capture the sublime beauty of the forest, combined with the wonderful charm of the forest animals and their playful everyday activities. I hope as you look at Bambi cresting the ridge of his domain, you too will feel empowered to live your best life and to count on a season of new beginnings, even when the challenges of life confront you. Truly for Bambi, and for us, life goes on." "Walt Disney said it all began with a mouse, and in the newest Disney movie classic you might say it all begins with a frog. The Princess and the Frog has been brought to life with hand-drawn animation techniques, making it the first Disney traditional animation classic in years as well as the first ever to be set in the enchanted city of New Orleans. In my painting I wanted to suggest the look of traditional animation yet maintain the sense of painterly mood that my work is known for. I lavished detail into the bayou flowers glowing with hidden fireflies, as well as the curving live oak draped with lacey Spanish moss. 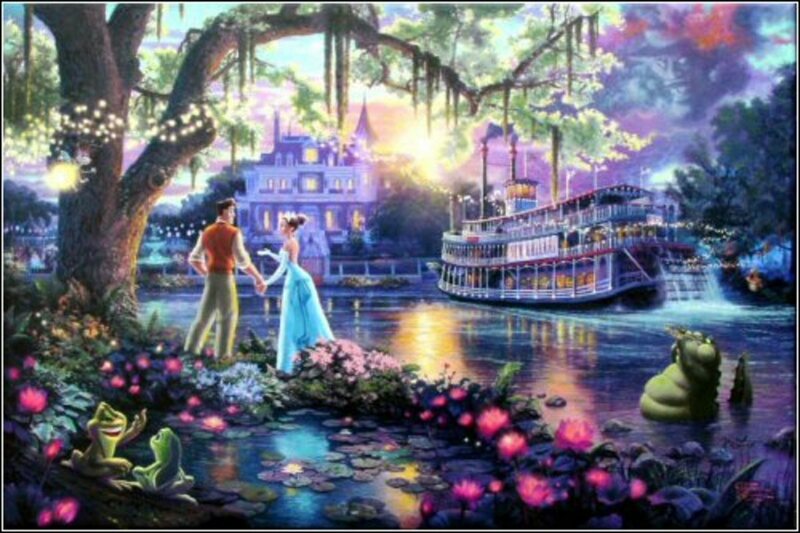 As the first piece in my 'Disney Discoveries Collection', The Princess and the Frog will no doubt experience an enthusiastic welcome by Disney and Kinkade fans worldwide. At its core, The Princess and the Frog painting, like the movie itself, portrays a romantic love story. And who can resist a love story?" 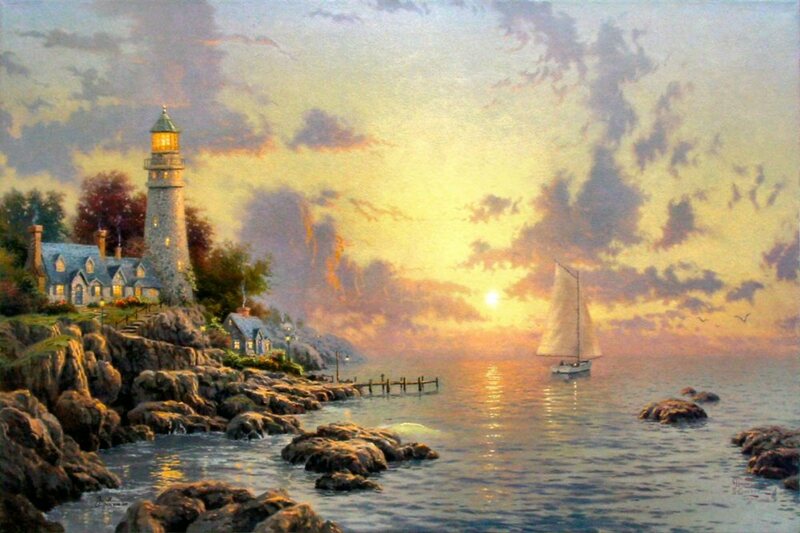 Thomas Kinkade's recurring theme of lighthouses is a reminder of simpler times: of sailing ships and oil lamps and the men and women whom day after day faithfully tended the coastal lights that guided mariners. waves eventually cause enormous wear and tear on these structures. In the 21st century there is much more than a lonely lighthouse to aid mariners. The modern Coast Guard consists of helicopters, small boats, cutters, aids to navigation, marine safety inspections and much more." 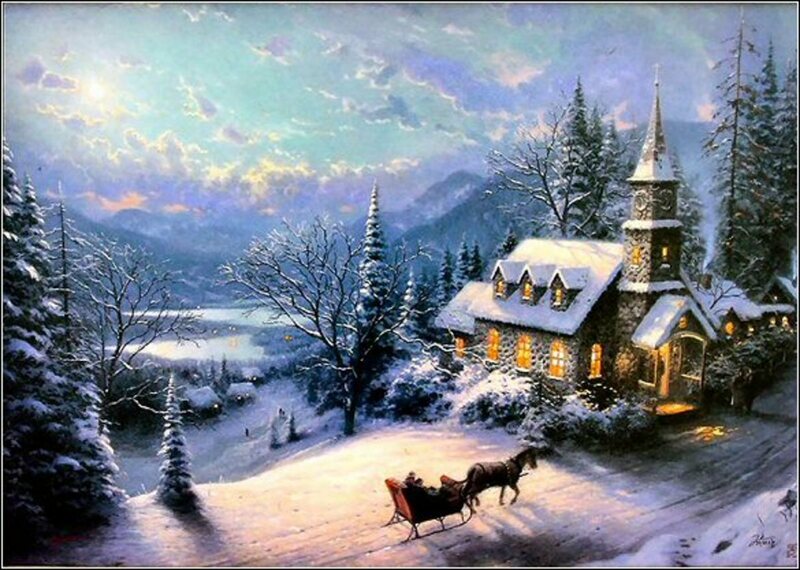 Thomas Kinkade is a proud Christian and many of his images have a Christian Theme. He writes "John 3:16" on every painting in the lower left or right hand corner along with the Christian Fish (Ichthys). 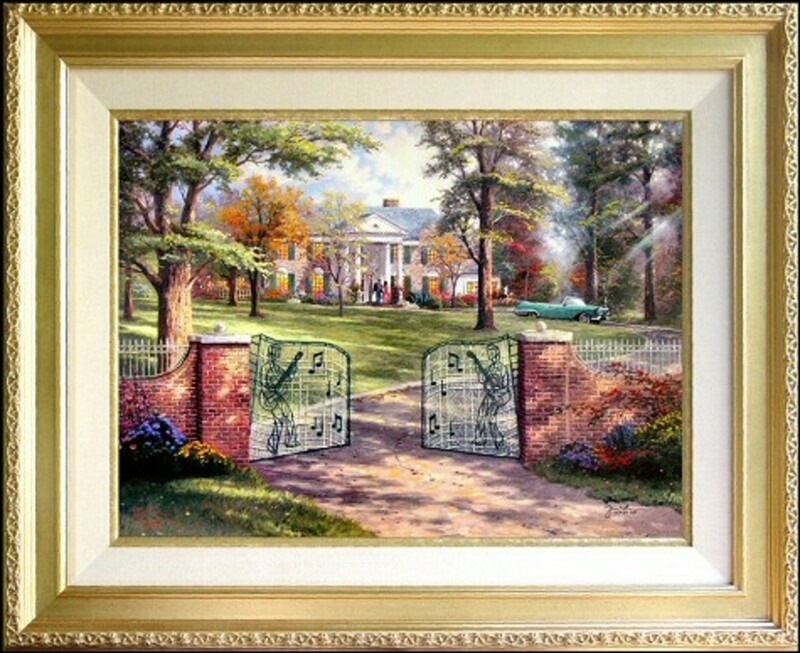 Graceland, 50th Anniversary is Thomas Kinkade's latest painting released at the Graceland Estate of Elvis Presley in March, 2007. 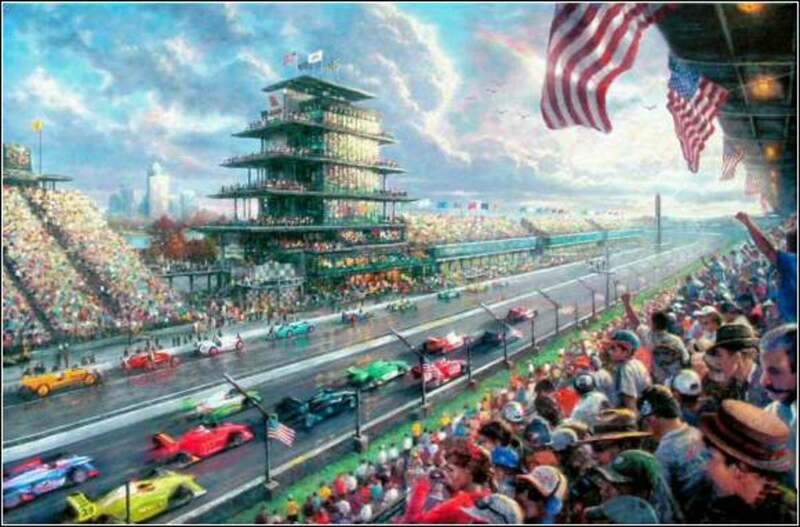 This release of of his tribute to the King of Rock 'n Roll has become one of Thomas Kinkade's most popular paintings. "The year 2007 marks a very special anniversary for Graceland. In March 1957, Elvis purchased Graceland for his home. And to commemorate this historic event, Painter of Light, Thomas Kinkade, has created his newest masterpiece Graceland, 50th Anniversary and will unveil it during this exclusive event. Kinkade visited Graceland in September 2006 to paint a study for the painting, and had this to say, Elvis Presley created rock and roll and changed music forever. Graceland was his refuge from the demands of his fame. My hope is that I will capture on canvas a bit of the home that he loved so much." 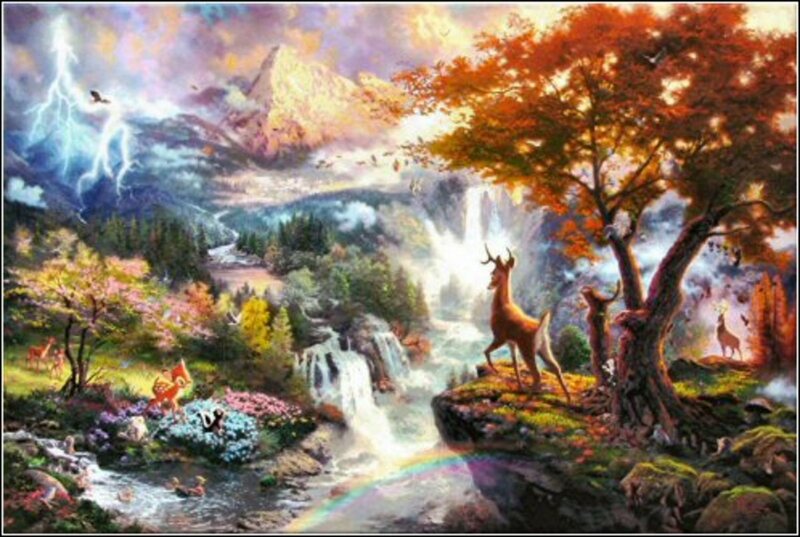 Thomas Kinkade art includes Symbolism in his art. Learn about the deeper meaning in Thom's art to gain a better perspective. Here is a list of what to watch for when viewing his art. He imbeds The letter N on every canvas in honor of his wife's name, Nanette. The number of Ns is indicated below the original oil signature in the lower right or left hand corner of the painting. The painting with the most hidden Ns is Golden Gate Bridge (144) and the smallest is Silent Night (2). The "light" in the paintings = "represents God's presence and influences". It also "illuminates and guides." Pathways, Trails & Tracks = path of life. Also the paths are lit so God can show us the way. Gates = many passages we face in our lives everyday and the many discoveries we have yet to make. It also can mean that heaven is open to all that is faithful. They are open to welcoming us in to a house or even heaven. Windmills = biblical symbol for the untamed human spirit. Dogwoods = There is a story that has been passed down for generation regarding this dogwood. Supposedly during Jesus' time, the dogwood was a strong, thick, and straight tree. When Jesus was crucified on this tree, God cursed it into a weak and crooked tree so that no man could ever be crucified on it. When the tree blossoms, there are five petals on the flower symbolizing the five piercing. The center of the flower is a red representing the blood of Jesus. Pink dogwood represents passion, white for purity. Tom was commissioned to memorialize the 2002 Winter Olympics in Salt Lake City, Utah. Tom commemorated the event with Olympic Mountain Evening. "Olympic Mountain Evening is my way of looking forward to the winter games. The thing that most excites me about the Olympics is the inspiring fusion of age-old tradition and cutting edge technology inherent in each competition." In October 2002 Tom was commissioned to paint the 2002 World Series Baseball games between the American League Champion Anaheim Angels and the National League Champion San Francisco Giants. Kinkade attended game two at Anaheim on Sunday, October 20, 2002 when he painted the action first hand from Edison International Field of Anaheim, home of the American League Champions, Anaheim Angels. Kinkade then traveled to San Francisco and attended game three at San Francisco on Sunday, October 22, 2002 where he painted the action first hand from Pacific Bell Park, home of the National League Champions, San Francisco Giants. 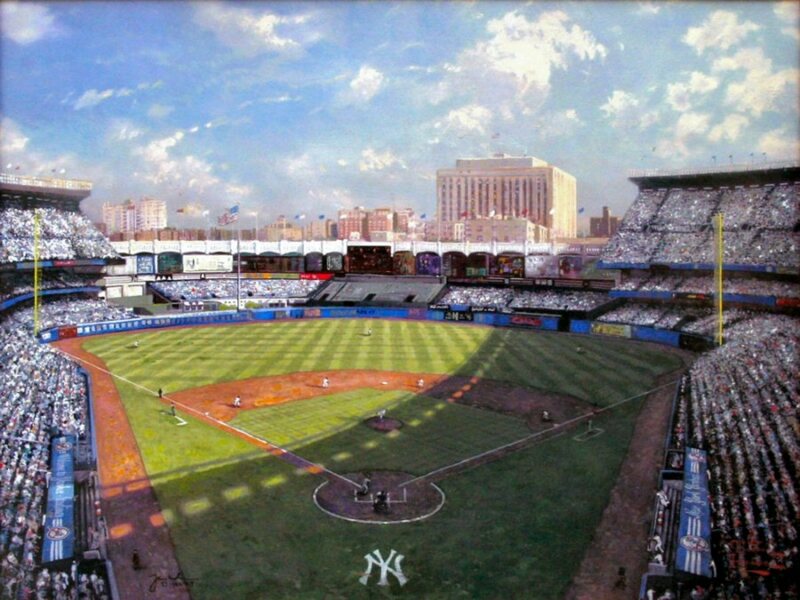 "In In 2008, Yankee Stadium, the greatest cathedral to the game of baseball, will close its doors forever. I could not let such a historic moment pass without honoring it in my way. This is the original Yankee Stadium - the house that Ruth built." 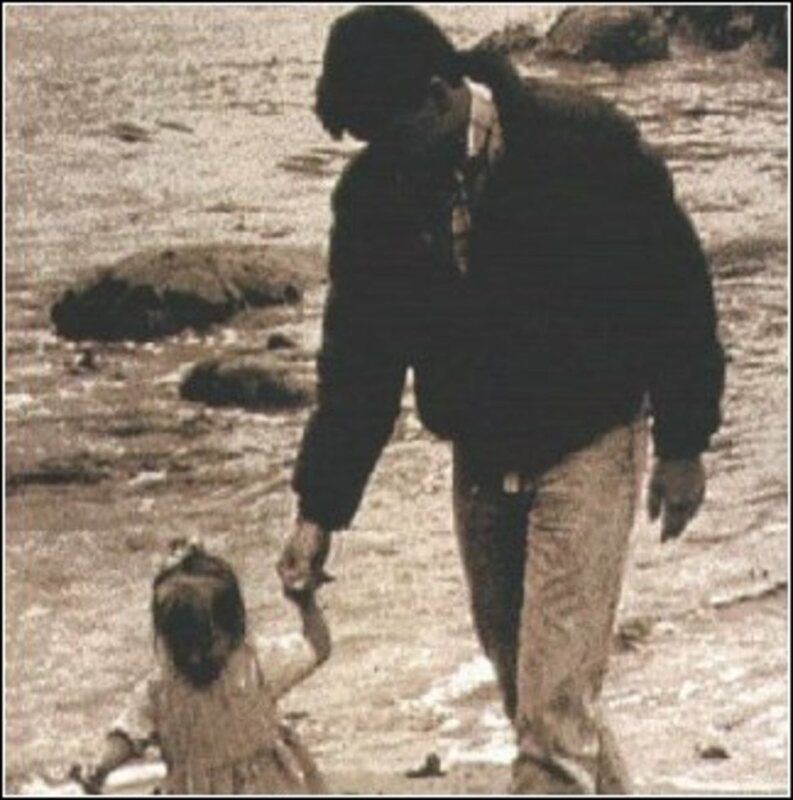 This heartwarming story is a must have for the video library of any Thomas Kinkade fan! Returning home from college one Christmas, young artist Thomas Kinkade is dismayed to learn that attempts to promote local tourism have failed and his mother is dangerously close to losing the family cottage to foreclosure. Inspired by his mentor, Glen, a famous artist who lives next door, Thom accepts a job painting a mural of his small, idyllic hometown. With Glen's help, Thom not only discovers his calling as the Painter of Light but also helps the town rediscover the true spirit of Christmas in this nostalgic, humorous and heartwarming true story destined to become a holiday classic. What are the fundamentals of art? What art has to do with communication and why? Art is a word which summarizes THE QUALITY OF COMMUNICATION. Enough Artistic Skill to produce the desired effect on the beholder. What is Artistic "message" and how does one get his message across? Art is the most uncodified and most opinionated subject on the planet. Art has been anyone's guess. Masterpieces have gone un-applauded while positive freaks have gained raves. Remember the elephant dung covering the Madonna, the mother of Christ at the Metropolitan Museum of New York? Works of Art are viewed by people. They are heard and felt by people. They are not just for the elite Forbes 400. Art is the soul food of all people. The message is what the Artist communicates to the PEOPLE. (not for heaven's sake Art Critics in the upper east side of Manhattan but PEOPLE). What defines a true professional in his field of art, versus a mere "dabbler" or dilettante? The Artist has technical expertise itself adequate enough to produce an emotional impact. This is true for any art form i.e. music, dance, acting, writing, etc. 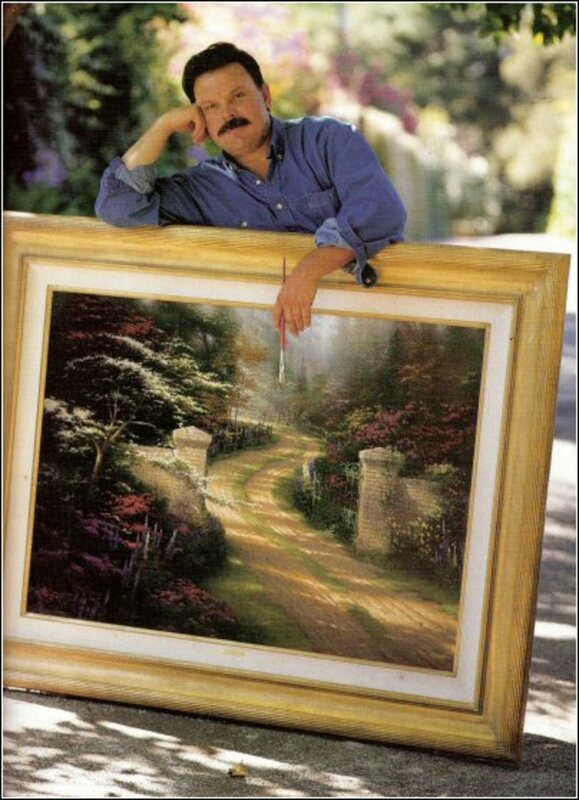 Why is Thomas Kinkade the most collected Artist on the planet? 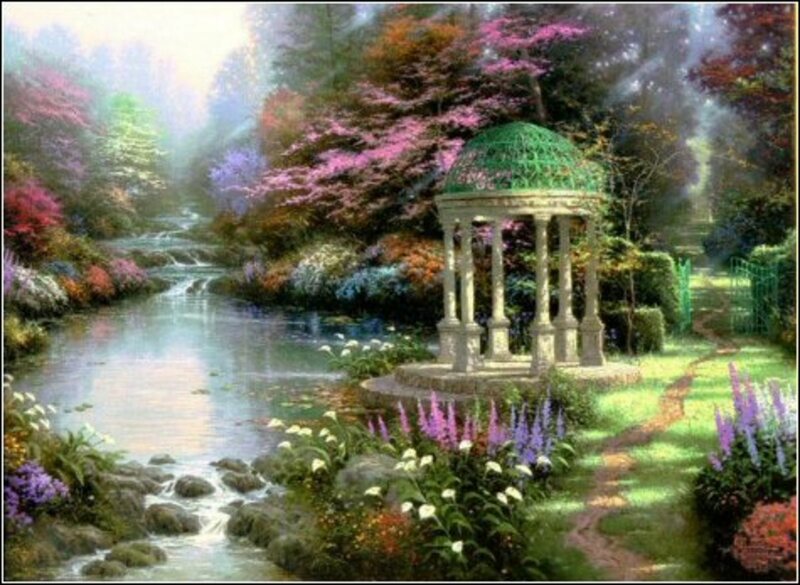 Because Kinkade conveys depth in art and uses color including color harmony, color depth, and color associations. Thomas Kinkade is widely regarded as the foremost living painter of light. His complex technique bears great kinship to a little known group of nineteenth century American painters known as the Luminists. As Kinkade puts it, "Like the Luminists I strive for three visual aspects in my work: soft edges, a warm palette and an overall sense of light." 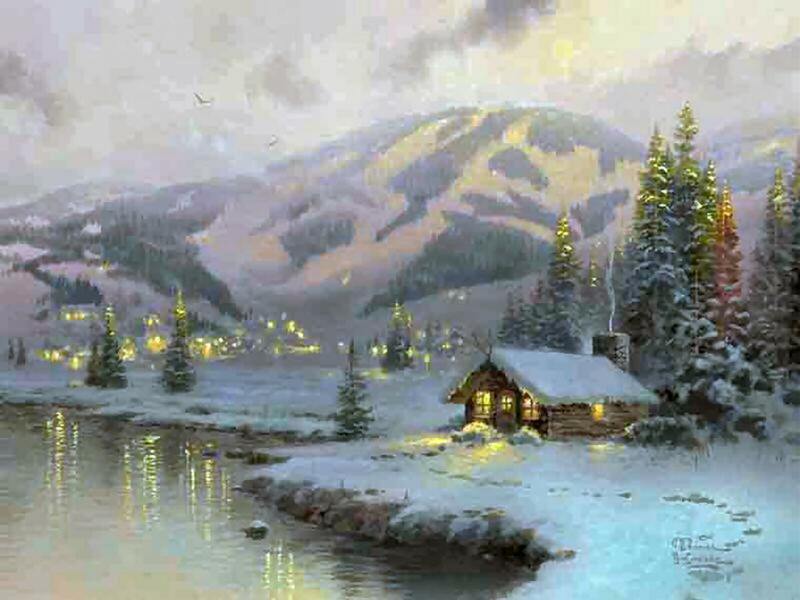 Kinkade's mastery of these three seemingly simple aspects gives his paintings the warm glow and idyllic softness for which he is known. 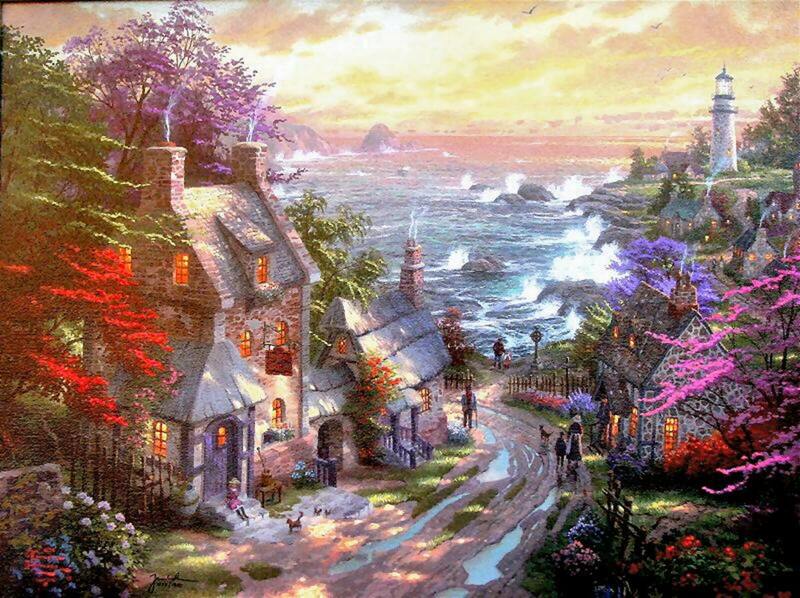 This special "Kinkade Glow" might help explain his enormous popularity as an internationally published artist. Large canvases will look best hung on a primary wall in any room, one that catches the eye when one enters a room. Artwork looks best when it hangs at eye level. This means that the center of the canvas should be at 60" above the floor. This is called museum hanging and is optimum height for most people who will view it. When you have a large piece of furniture below your target wall, it is generally held that you should allow for 6-8", even though this may be higher than museum hanging. Rooms where works of art are to hang should have a weak daylight and must be illuminated with incandescent lighting, which is relatively harmless. 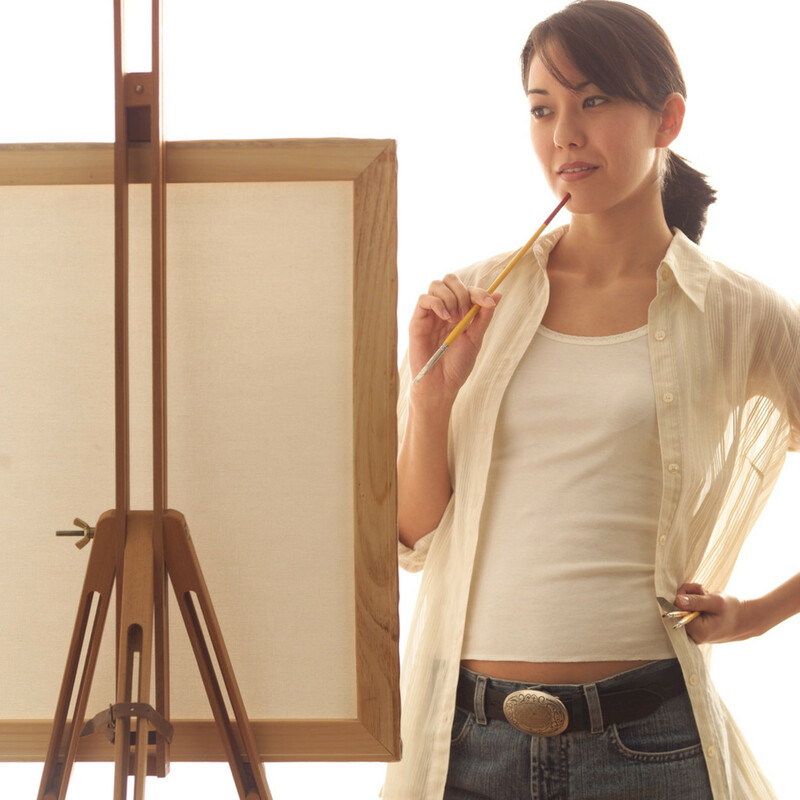 Do Not display your artwork in an environment with high humidity, as mold can grow on the back of the canvas. Do Not hang your artwork in direct sunlight! Even though your image has been coated with a special ultra-violet light protectant, direct sunlight over a period of time may fade the image. Do Not hang your artwork near radiators and other sources of heat. If hanging your artwork above a fireplace, be sure to allow for adequate ventilation as smoke and heat may damage the image over time. Never use a solvent to clean any part of the canvas! 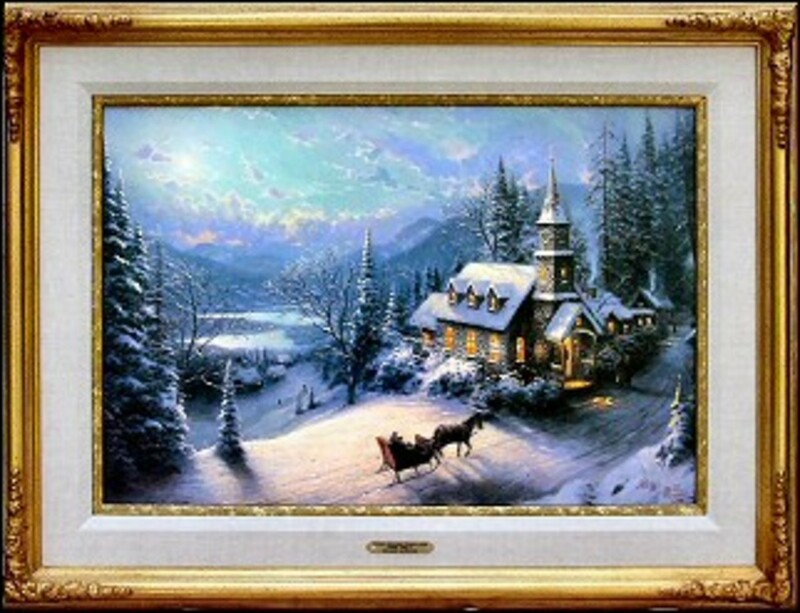 It is recommended that the owners of limited edition Kinkade canvasses regularly clean the canvas image. This helps to preserve the print from fading and from harmful pollutants. Anyone with a wood burning fireplace should wipe the canvas clean after every burning. Smokers should also clean their prints at least twice a month. Leaving smoke residue on a canvas lithograph can change the color of the painting but this is rare. Simply use a lint free cloth that has never had any type of cleaning solution on it. 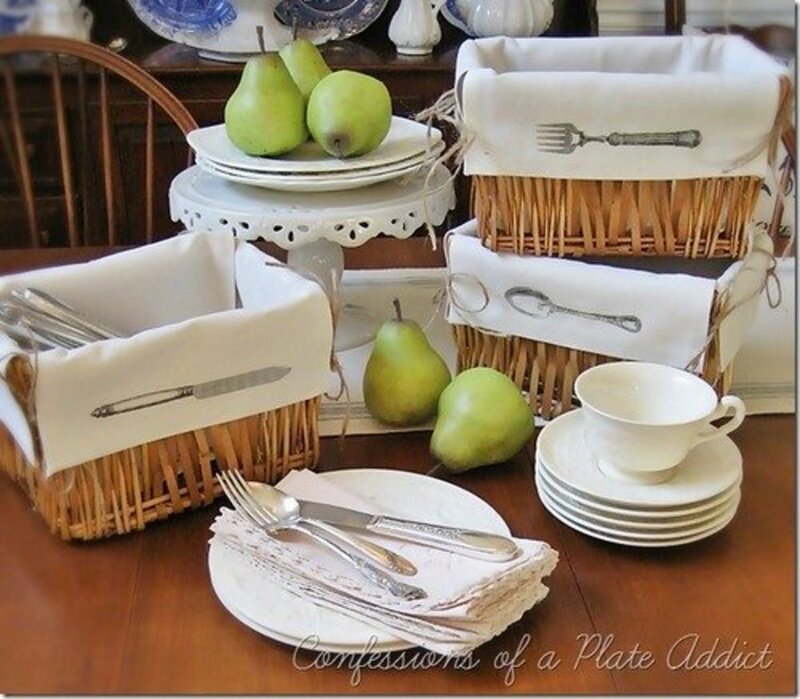 Lightly mist the cloth with clean water (preferably distilled), and gently wipe off the image. This can be done on a regular basis. Owners can also lightly spray the back of the image with water. This will tighten the canvas to correct any sagging that may occur with age. One collector called with the problem that a visiting nephew bumped her Kinkade canvas and caused a slight dent. She was able to alleviate the problem by lightly spraying the back of the canvas. Under normal conditions a stretched canvas may loosen over time. If the canvas should become loose, apply a small amount of hot water to the BACK of the canvas with a rag or spray bottle. As the canvas dries it will tighten back up. NEVER use water for a Giclee' editions (also know as the A/N), Studio Proof or Renaissance edition! that provides smooth even illumination across the entire canvas. LIGHTS WITH THE BUILT-IN DIMMER SWITCH! Designed to protect your fine art investment with special bulbs with filtersto block damaging heat and all harmful ultra violet light, meeting the strict requirements and guidelines. 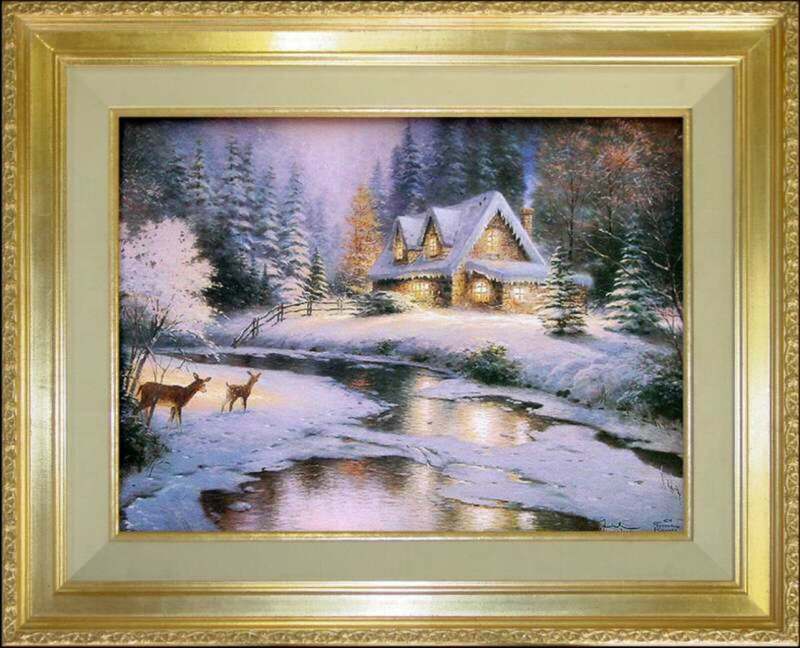 Ioffer CUSTOM sized Thomas Kinkade Museum Quality gallery frames in several different designs to fit your personal artwork needs. Depending on your requirements, custom frame orders typically take 4 to 5 business days to prepare for shipping. Thomas Kinkade painted under the cover of the fictitious alias "Robert Girrard". 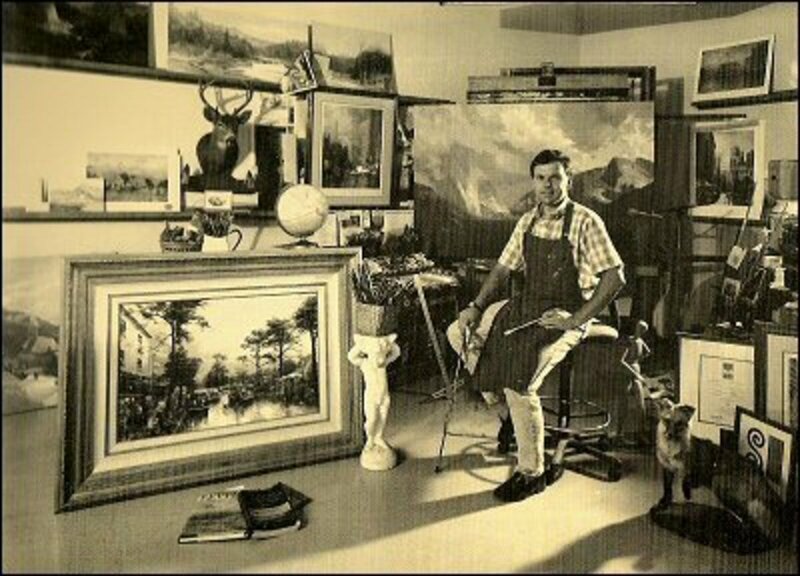 Thomas Kinkade created a series of studio paintings and Plein Aires (see below for definition) from 1984 to 1989 and signed them with the name "Robert Girrard". 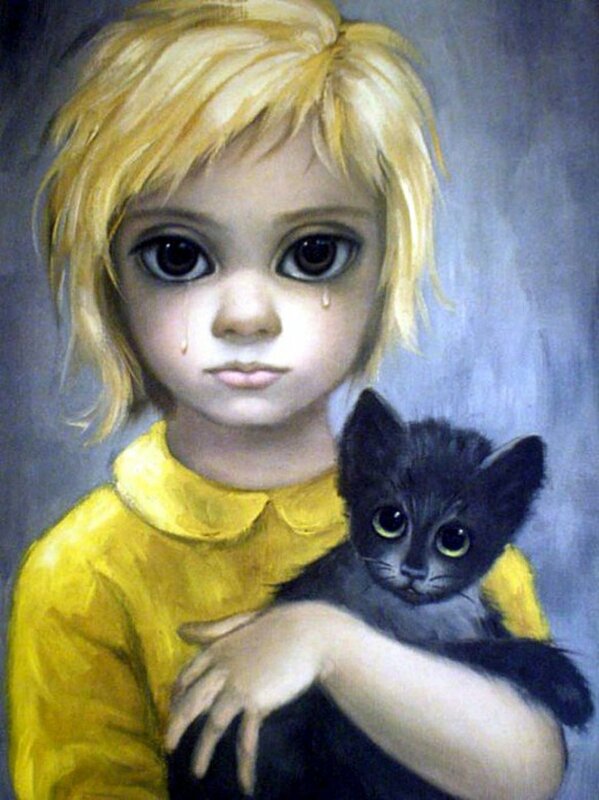 There are approximately 70 Robert Girrard paintings in existence. Collectors purchased these rare, small quantity release paintings not knowing they were acquiring a valuable Kinkade. 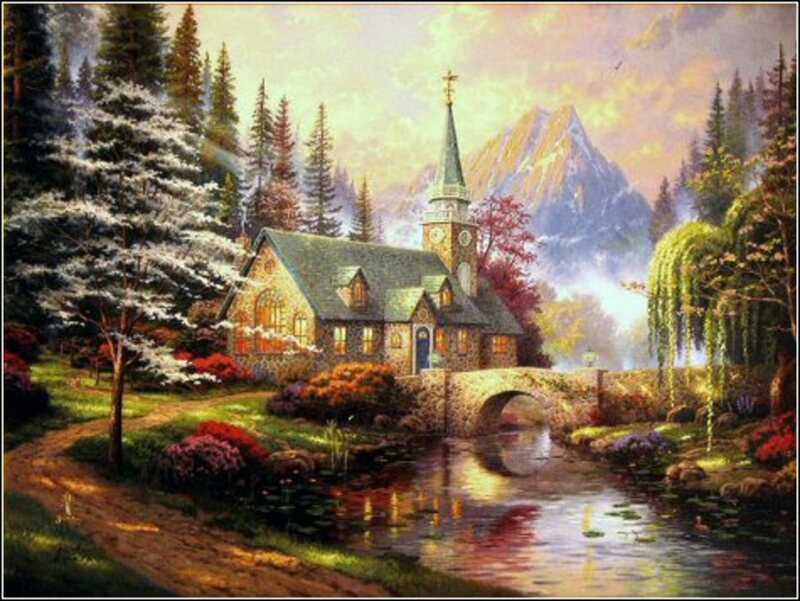 Some collectors actually thought Robert Girrard was copying Thomas Kinkade! 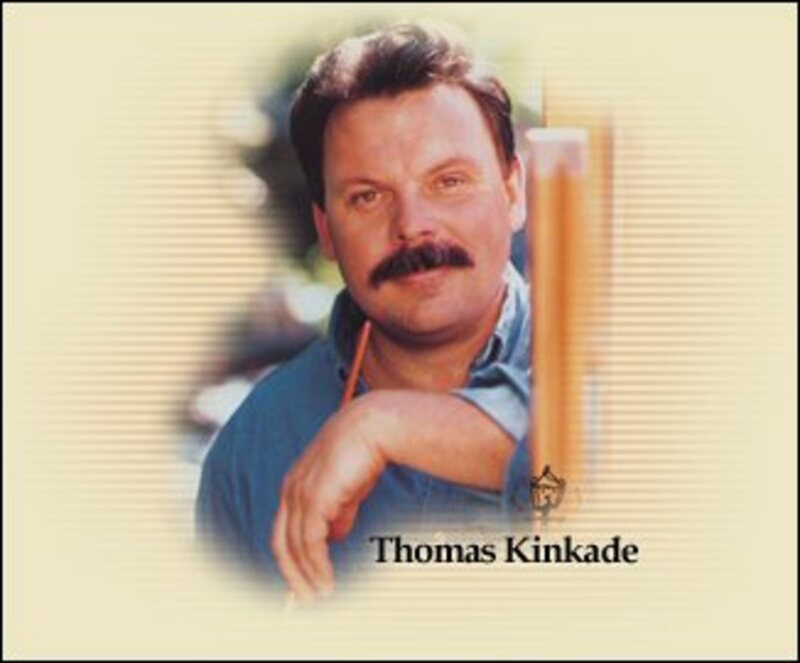 Thomas Kinkade became "Robert Girrard" in order to experiment with artistic freedom. Thomas Kinkade wanted to work in the style of French impressionists and desired to paint in that manner. (His paintings are remarkably like Claude Monet). As a believer in re-incarnation I will admit I believe that Thomas Kinkade WAS Claude Monet! But Thomas Kinkade believed his collectors would be startled at this different style and he did not want to lose his audience. Hence "Robert Girrard". 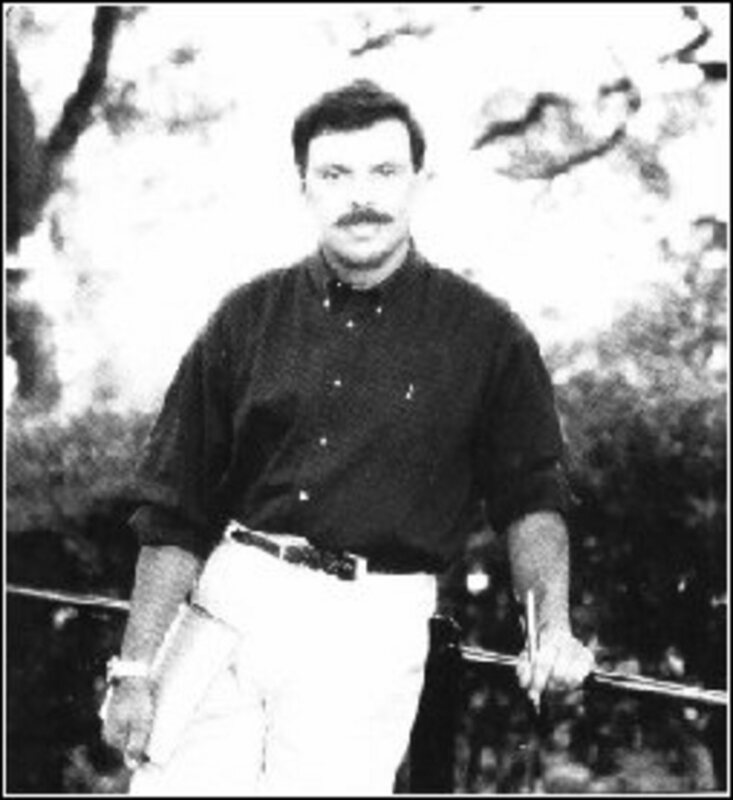 Thomas Kinkade outed himself as Robert Girrard through a statement released by Media Arts Group early in 2002. 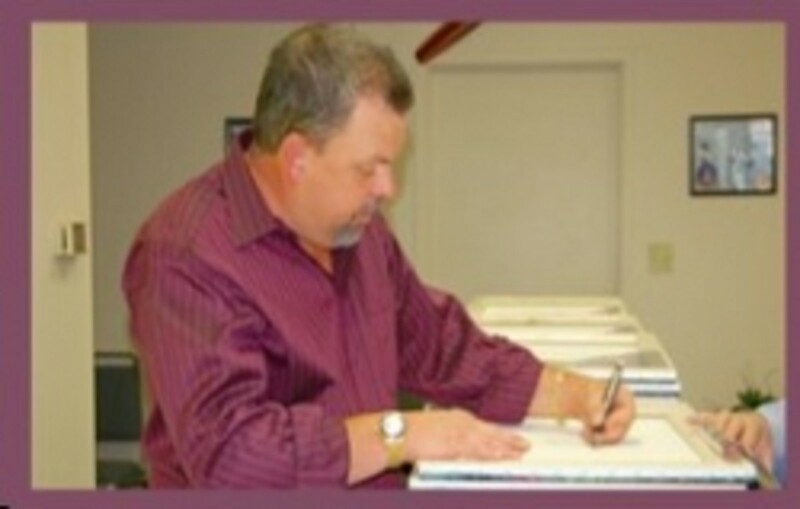 These days when you purchase a Robert Girrard it is double signed -- Signed by Robert Girrard and Thomas Kinkade. A Plein Aire (French : open Air) is a painting done outdoors by an Artist on his easel from beginning to end in one sitting. Many collectors feel this is true art. There are no later "touch ups" in a studio. Plein Aire is a more impressionistic painting style that features broad dabs of pigment which look better from a distance. Call to Purchase Robert Girrard Art! Here is your opportunity to add the "Kinkade Flair" to your home without breaking the family budget. 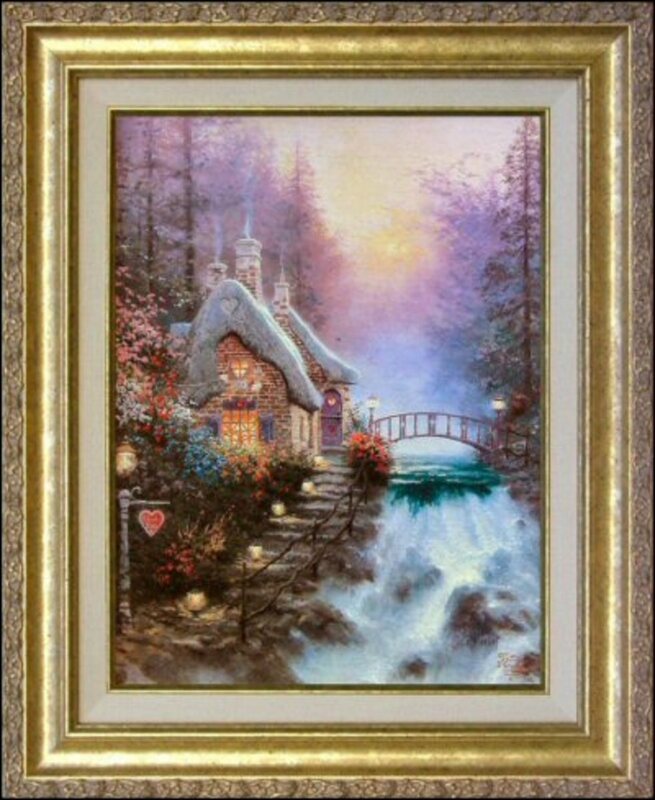 For the more frugal shopper, Thomas Kinkade has released a selected series of his more popular paintings in a more affordable form. A high quality lithograph overlaid on canvas, each Kinkade Classic Canvas presents much of the look and feel of a Thomas Kinkade Limited Edition. Every Kinkade Classic Canvas is presented in a museum quality frame designed to coordinate with the most popular Thomas Kinkade Limited Edition frame styles. 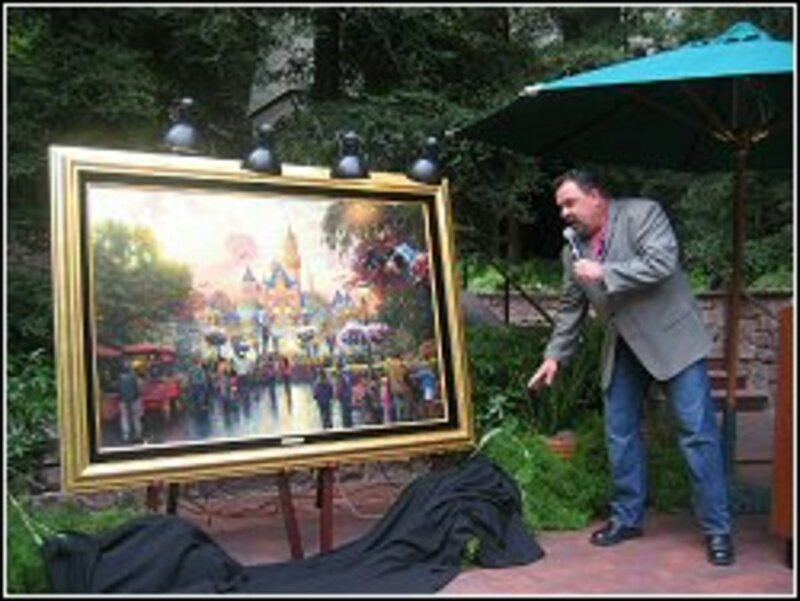 A Certificate of Authenticity guaranteeing that your Classic is a "Genuine Kinkade" and recreates the original painting to Thomas Kinkade's own specifications. A plaque (golden in Color) with the title of artwork and artist. Have Questions? Please feel free to contact me!